Best Bets are now posted on my blog under the category of “Best Bets”. The Spring season has officially arrived, and to help celebrate fresh new potentials there is a crop of exhibitions at local galleries and museums featuring emerging and newly discovered artists. For starters, the current exhibition at Marin Museum of Contemporary Art, in Novato, is Emerging Artists of the Bay Area. The work for the exhibition was selected through a jury process by Kenneth Baker, and features the work of five artists; Justine Frischmann, Al Grumet, Carl Heyward, Phillip Hua and Jennifer Kaufman. The selected work includes two site-specific installations created for the exhibition. One, a 20-foot mural by Phillip Hua, uses images of nature which are digitally composed, printed, and then painted onto separate sheets of financial newspapers. As the newspapers yellow and degrade over time, the process suggests the fragility of our natural and economic resources. The other installation is a piece by Jennifer Kaufman that spans two rooms. Kaufman’s uses tape, which is applied directly on the walls and ceiling of the gallery space, to create a drawing that responds to the history, architecture and location of the museum’s 1934 building that once served as the administrative headquarters of Hamilton Air Force Base. A panel discussion with juror, Kenneth Baker, and the five participating artists takes place on March 29, from 2 to 3 p.m. The exhibition will be on view through April 13. The Marin Museum of Contemporary Art is located at 500 Palm Drive, Hamilton Field, Novato. For more information check their website, marinmoca.org. Next, the Healdsburg Center for the Arts has just opened an exhibition called 2014 Emerging Artists. This inaugural exhibition was initiated by a grant from the Merede and Barbara Graham Fund and highlights nine young artists, ages 18 to 27, who are just beginning the careers in the arts. The artists, Kendra Barajas, Will Elias, Kacie Gansel, Hillary Gattian, Ariel Lockshaw, Isaac Lopez, Drew Prestis, Hadley Radt, and Meg Regelous, work in a range of media, including painting, printmaking, drawing, sculpture, and ceramics. The selected work provides insight into how traditional materials still find individual expression through the creative process when shaped by the influences of the Internet and a post-modern world, or as a reaction to both. The exhibition continues through April 27. Healdsburg Center for the Arts is located at 130 Plaza St., in Healdsburg. For more information check their website, healdsburgcenterforthearts.com. Charlotte and Jesse, by Erik Castro. Then, at the Sonoma Valley Museum of Art, the new exhibition is Discovered: Exceptional Artists of Sonoma County. Four artists, Stan Abercrombie, Erik Castro, Maura Harrington and Miles Votek were selected by a team of jurors for their exceptional creative excellence and individuality while still in the early stages of their careers. With work in painting, photography and mixed media, the exhibition is fresh, provocative, as well as beautiful. The Discovered awards program is a collaboration between the Sonoma Valley Museum of Art and the Community Foundation of Sonoma County in their mutual goal to support the exposure and advancement of Sonoma County’s emerging artists. A Gallery Talk with artists Stanley Abercrombie and Erik Castro will take place on Tuesday, April 8, at 6 p.m. The exhibition will be on view through April 27. The museum is located at 551 Broadway, in Sonoma. For more information check their website, svma.org. Natural Paradigm, by Maura Harrington. At the Marin Community Foundation, in Novato, the current exhibition is called, California Dreamin’. The work in this juried exhibition explores subject matter that addresses the idealizations as well as realities of living in America as an immigrant, and reflects the artistic impulses of immigrant artists inspired by a mix of cultures. Almost two and a half centuries after its founding, the United States continues to be a nation of immigrants, who continue to make contributions on many levels. Today, immigration policy remains an important yet very complex issue. The juror, Julio César Morales, was born in Tijuana, Mexico and is a graduate of the San Francisco Art Institute. Morales selected over 100 artworks by 34 foreign-born artists who reside in the San Francisco Bay Area. A variety of media is represented in the exhibition including works form the Latino Photography program at Gallery Route One in Point Reyes. A reception for the artists will be held on Thursday, March 13 from 4:30 to 6:30 p.m., and the film Sin País (Without Country) will be shown at 5 p.m. and 6 p.m., with an opportunity for Q & A with the filmmaker, Theo Rigby. The exhibition will continue through May 16. Marin Community Foundation offices are located at 5 Hamilton Landing, Suite 200, in Novato. For more information check their website, marincf.org/news/events-calendar. Then, the new exhibition in the University Art Gallery at Sonoma State is West Coast Ink: Printmaking from San Diego to Seattle. The exhibition, which has been organized by Kurt Kemp, Professor of Printmaking, and Michael Schwager, Professor of Art History and Director of the University Art Gallery, displays a wide range of contemporary printmaking techniques and approaches, including etching, lithography, linocut, monotype, silkscreen, woodcut, digital, and tapestry by artists from the West Coast and beyond. Some of the twenty featured artists are Sandow Birk, Kota Ezawa, Kevin Fletcher, Hung Liu, and William T. Wiley. The exhibition is presented in conjunction with “Bridges”, the annual international conference of the Southern Graphics Council. The conference is being held in San Francisco this year, and numerous Bay Area art venues and organizations are participating with events throughout the month of March. The exhibition at SSU opens with a reception on Thursday, March 13, from 4 to 6 p.m., and remains on view through Sunday, April 13. For more information check their website, sonoma.edu/artgallery. The Sebastopol Gallery is highlighting the work of their two newest member artists. From the Shadows, Out, features paintings by Jeff Watts, and photography by Mike Shoys. A reception for the artists takes place on Saturday, March 15, from 5 to 7 p.m. The show runs through April 26. Sebastopol Gallery is located at 150 N. Main Street, Sebastopol. www.sebastopol-gallery.com. Calabi Gallery is announcing their move to a new location in Santa Rosa with a Grand (Re)Opening Celebration Saturday, March 15 from 3 to7 p.m. The Inaugural Group Exhibition features a sampling of their eclectic collection of 19th to 21st-century art, with a particular focus on notable artists of the North Bay Area. Formerly in Petaluma, Calabi Gallery is now located at 456 Tenth Street in Santa Rosa. calabigallery.com. Pedacos de Paisagem, by Bob Nugent. In Healdsburg, Erickson Fine Art Gallery is showing Pedaços de Paisagem, new work by Bob Nugent. Continuing with his Brazil inspired subject matter, these are entirely new works completed within the last three years. The Opening Reception is on Saturday, March 15, from 5 to 8 p.m. The show continues through April 14. The Gallery is located at 324 Healdsburg Ave., in Healdsburg. ericksonfineartgallery.com. Just a little further north, the Cloverdale Arts Alliance Gallery is showing Launching, a mixed media group show with a special focus on woodwork by artist, Paul Maurer. The show opens with a reception on March 15, from 5 to 8 p.m., and will be on view through May 16. The gallery is located at 204 N. Cloverdale Boulevard, Cloverdale. cloverdaleartsalliance.org. We lost a big shining star in the art world last week with the passing of John LeBaron. During his long career John touched the lives of many people. Through his many years as a photographer for The Press Democrat and then as a teacher of photography at Santa Rosa Junior College, he inspired, supported, and encouraged the work of many others. It was always nice to see John and his wife, Gaye LeBaron, out and about, attending and participating in various art events. He will be missed, but he will not be forgotten. Currently a retrospective of John LeBaron’s work can be seen at Corrick’s Gallery in downtown Santa Rosa. The work is displayed throughout the store so be sure to look around. The work is scheduled to be up through the month of April. For more information visit their website, www.corricks.com. Then at the Agrella Gallery on the Santa Rosa Junior College campus, the current exhibition is the 2014 Art Faculty Show. The exhibition highlights new and recent work by over 20 members of the Art Department faculty, and represents the variety of media taught in the department including painting, printmaking, photography, sculpture, and mixed-media. What impressed me was that the quality of work is indicative of a teaching staff that is comprised of dedicated, working artists—some who are exploring and pushing the boundaries of their media, as well as those who are mastering traditional methods and techniques. The exhibition continues through March 13. For more information check their website, www.santarosa.edu/art-gallery. 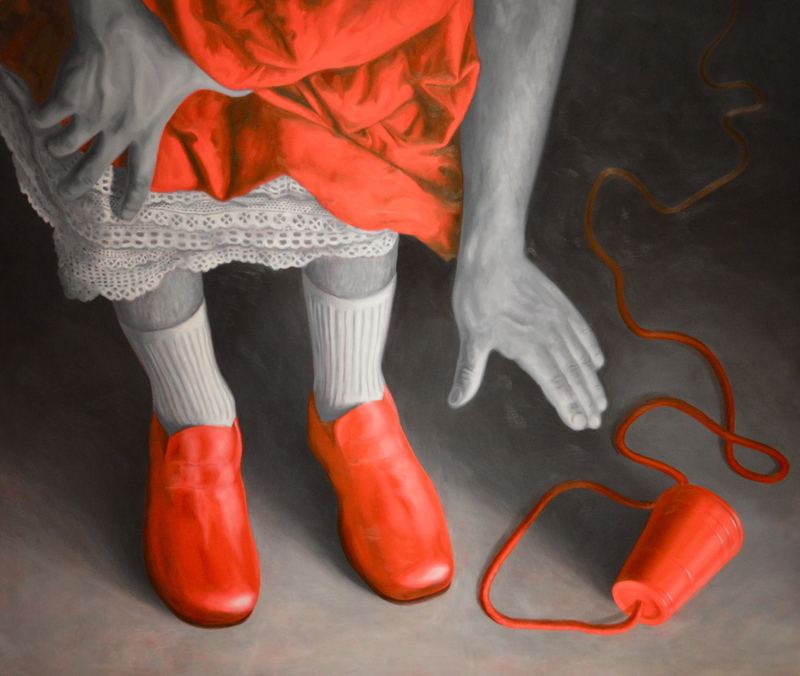 Next, at Sebastopol Center for the Arts, the current exhibition in the Main Gallery is called In the Red. The exhibition includes over 70 pieces in a variety of media by artists from around the country. The juror, Susan Kantor, curatorial assistant at the Yerba Buena Center for the Arts, stated that she selected work portraying a “multitude of connotations associated with the color red—from passion to danger, love and anger, fire and luck, just to name a few—creating an exhibition that incorporates a variety of emotional and ideological meanings.” Also showing at SCA is The World Up Close, floral paintings by Deborah Garber in Gallery II, and Infrared Landscapes, photography by William Anderson in Gallery III. The exhibitions continue through April 4. For more information check their website www.sebarts.org. The current exhibition at RiskPress Gallery, in Sebastopol, is The Poetry of Printing featuring letterpress works by sixteen artists who are members of the Iota Press co-op. You can see beautiful examples of handmade artist’s books, poetry broadsides, and even printed fabric and pillows. Letterpress printing is a typesetting technique that employs movable type set into a printing press. Developed during the 15th century, letterpress printing is experiencing a renaissance with artists using both traditional as well as with innovative applications. To see how it’s done or perhaps try your hand at it, letterpress printing demonstrations take place every Friday afternoon. Then on Sunday, February 16, from 2 to 4 p.m. the group is presenting A Speak Easy–Sounds in Print. This will be a poetry reading by Iota Press co-op members and others, and will include a performance –a chorus of words, which promises to be a lively and fun event, especially for lovers of words! The exhibition continues through February 23. RiskPress Gallery is located at 7345 Healdsburg Ave., in Sebastopol. For more information, check their website, www.riskpress.com. Then at the Hammerfriar Gallery in Healdsburg is Bella Feldman: Flasks of Fiction. This small but dynamic exhibition features glass and metal sculptures by the Oakland-based artist who was known in the 1970s as a pioneer of women sculptors. Now in her 80s, Feldman continues to create powerful yet elegant works that draw on her life experiences and personal perspectives. The works in this exhibition evoke a balance of tension that is felt between the hardened steel and fragile glass. Their bold yet simple forms make references to stories, memories and metaphors. Feldman was a professor of sculpture at California College of Arts for 36 years, and her work is in the collections of the de Young Museum, UC Berkeley Art Museum and the Oakland Museum. The work will be on view through March 1. Hammerfriar Gallery is located at 132 Mill Street, Suite 101, in Healdsburg. For more information, check their website hammerfriar.com. Finally, you still have time to get over to the Petaluma Arts Center to see Form and Finish: Sculptures by Michael Cooper and John de Marchi. The exhibition features the work of two distinguished sculptors, Michael Cooper and John de Marchi, who maintained an enduring friendship until de Marchi’s passing in 2011. They shared a love for tools, quality finishes, superbly designed and crafted objects, as well as teaching what they loved. Cooper and de Marchi are both internationally acclaimed artists who have maintained studios in Sonoma County, California for many decades. On Sunday, March 2, 1:30 to 3:30 p.m., Michael Cooper will host a tour of his studio. Contact the Arts Center to reserve a place, $50 members; $65 general (includes a signed poster and refreshments). The exhibition continues through March 16. For more information go to petalumaartscenter.org. First off I want to wish everyone a happy, healthy, and prosperous New Year. Now that the local art scene is beginning to revive from the many compulsory holiday shows and sales we’ll be seeing a number of new exhibitions opening in the area throughout the month. For starters, the new exhibition at Risk Press Gallery in Sebastopol is a selection of new work by Seymour Bergman. Working in his Healdsburg studio, Bergman creates large colorful works on paper. While at first glance they often have a playful appearance, Bergman likes to impart meaning and social/political commentary into his work. Through the aesthetic appeal of his work Bergman expresses the tension of the beauty and the beast, dancing on the same stage. Often reflecting on his Jewish heritage, family life, and society, Bergman states that his work is a response to being “a witness to the perplexity of the human condition, at once beautiful and horrific”. The exhibition opens with a reception on Saturday, January 4, from 5 to 8 p.m. and continues through January 25. Risk Press Gallery is located on Healdsburg Ave., in Sebastopol, for more information, check their website, riskpress.com. Then at the Sonoma Valley Museum, on Broadway, in Sonoma, the new exhibition that just opened is called Site & Senses: The Architecture of Aidlin Darling Design. The exhibition features the work of Joshua Aidlin, David Darling, and their award-winning design team. The exhibition includes color palettes, three-dimensional models, sketches, photographs and videos that reflect the firm’s unique multi-sensory approach to architectural design. To develop their signature approach, which gives consideration and emphasis to all the senses, the partners have been known to pitch a tent and spend a full day observing the terrain, vegetation, lighting, and weather conditions that will inform their architectural concept. The early models which evolve from this gathering of information are often intentionally abstract and vague. The purpose is to initially express the character and spirit of a design that would, in the end, be most appropriate to the location, function, and needs of the client. A number of related programs and events will be presented during the month of January. The exhibition will be on view through March 2. For more information about the exhibition and programs, check their website svma.org. Here is a bit of a round-up of some new art shows and events in the area. First, Sebastopol Center for the Arts is having a Party to celebrate their 25th Anniversary as one of the premium art centers in the North Bay. The Party coincides with the opening reception for their Annual Member’s Exhibition. The party and reception take place on Friday, December 13 from 6 to 9 p.m. Tickets for the event are on sale on their website and at the door. The admission price of $10 for members and $15 for nonmembers includes live music with the Mark Growden Trio, refreshments, and of course seeing a lot of wonderful artwork by over 300 artists. The exhibition continues through January 4. The art center is located in the Sebastopol Veterans’ Memorial Bldg. on South High Street. For more information or to purchase tickets to the event check their website, sebarts.org. Then at the Sebastopol Gallery, on Main Street, the new exhibition is called Beneath The Surface, paintings by Bert Kaplan, and assemblage by Rebeca Trevino. Kaplan uses pastels to create landscapes that evoke a sense of stillness and transformation. Trevino tells stories and shares wisdom through her 3-dimensional assemblages which are made from salvaged and found objects. The exhibition will be on view through January 4. For more information check their website, sebastopolgallery.com. Next at the Graton Gallery, in downtown Graton, the newly opened show is called Sun-Drenched Solitude, watercolors by Sally Baker. These new works by Baker are inspired by images from the southwest. The exhibition continues through January 12. For more information check their website, gratongallery.com. Lastly, there is a new artists’ venue opening in Fulton, which is just northwest of Santa Rosa. The new owner of the former chicken processing plant is transforming the old building into what is being promoted as artisan studios and exhibition spaces. The Grand Opening celebration takes place on Tuesday, December 17, from 5 to 10 p.m. Local artists will be showing their work in pop-up exhibits along with food and refreshments. Sounds interesting, if you want to see what’s going on, go the corner of River Road and Fulton Road, just west of Hwy 101, on December 17. Currently on view at the Petaluma Art Center is their 13th Annual Member’s Exhibition. The theme for this year is The Place Where We Live. The artwork in the show reflects on a sense of place and belonging in the community through its natural, cultural, and personal attributes. Each year during the member’s show a special tribute is given to a local artist, and this year the honor goes to Janet Charnofsky. Janet is a talented painter and long-time dedicated supporter of the arts. And on Saturday November 23, from 1 to 4 p.m., Janet Charnofsky and Maggie Bolt will be available in the gallery to talk about the wide selection of art by participating members. There will also be an Artist’s Talk in the Gallery on Wednesday, December 11, from 6 to 8 p.m. The exhibition continues through January 5. For more information check their website, petalumaartscenter.org. Then at the Graton Gallery, in downtown Graton, the current exhibition is New Work: Paintings by James Freed and Sandra Rubin. Also on display is work by two guest artists, Peter Krohn, who creates photo-based images using a state-of-the-art scanner and a variety of natural and found objects, and Marcia Lavine, who uses industrial weight felt to create soft sculptural pieces that focus on form and color. The exhibition continues through December 1. For more information check their website, gratongallery.com. I also wanted to mention the organization called ART Contemporary Marin, which was previously called Art At The Cheese Factory. While they don’t actually have a gallery space of their own, they plan and organize art exhibitions at various locations throughout Marin County. They also host art related events, educational programs, art in public places, and other exhibiting opportunities for artists. Their two current exhibitions are Big is Beautiful, a juried show at the Bay Model Visitors Center Gallery in Sausalito. And the Media Mix exhibition at the Marin Civic Center Gallery, which is showing artwork that combines multiple and unusual materials to create new images. Both exhibitions continue through December 31. For more information about their programs, check their website artcontemporarymarin.blogspot.com. The new exhibition in the Santa Rosa Junior College Art Gallery is called Making Special. The premise of the exhibition, according to the curator, Gina Telcocci, is that the very act of art-making has promoted human survival and evolution over the millennia. The six artists featured in the exhibition share a tendency toward recognizing and collecting commonplace and discarded materials such as stones, twigs and branches, thread, used clothing, and tools. Then, through their individual processes of art-making, they transform these materials into objects of refinement, beauty, and meaning. The exhibition opens with a reception on Thursday, November 14, from 4 to 6 p.m., and continues through December 12. For more information check their website, santarosa.edu/art-gallery. Then, currently on view in the University Art Gallery at Sonoma State is Mark Perlman: A 25 Year Survey. This is the second of two exhibitions honoring Perlman’s upcoming retirement from 25 years of teaching in the Art Department at SSU. The exhibition presents a selection of paintings and works on paper that chronicles his career as a professional artist since joining the faculty in 1988. 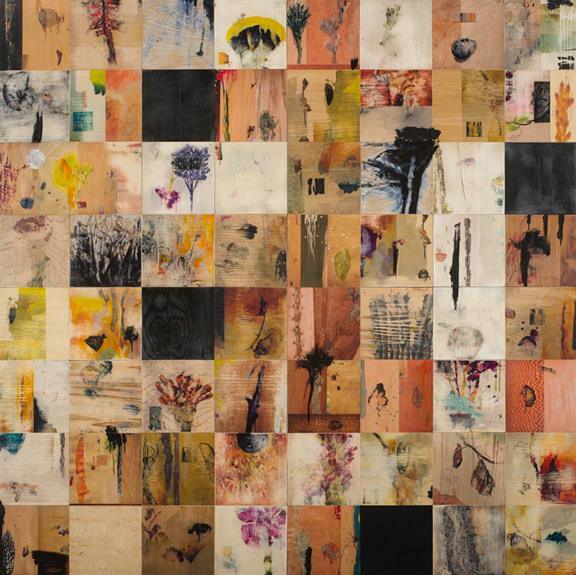 Perlman’s work is unified through his use of encaustic; an ancient technique that consists of pigments suspended in a solution of melted wax. The material gives the surfaces of his paintings a depth and luminosity. 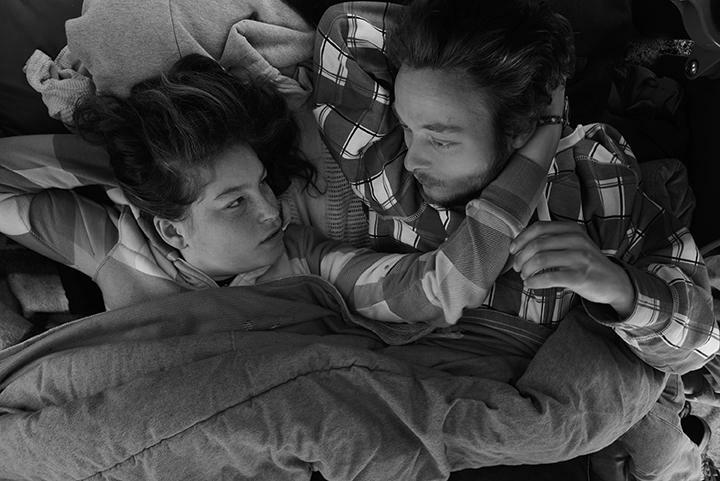 Perlman’s work includes many layers of textures as well as imagery that unfold with patient and careful viewing. The exhibition continues through Sunday, December 15. For more information check their website, sonoma.edu/artgallery. Lastly, The 9th Annual Winterblast Art Party takes place in the SOFA Arts District of Santa Rosa, on Saturday, November 16, from 5 p.m. to 8 p.m. This one-day event includes over 35 open artists’ studios, art galleries, live music and entertainment, a disco party, and of course the Sofa Parade, plus food and drinks for purchase, and lots of fun. The location is in the South A Street neighborhood, and the admission is free. For more information check their website, sofasantarosa.com/events. The new exhibition at Risk Press Gallery, in Sebastopol, is called Signs of Passage. The work in the exhibition focuses on the art of animal tracking, and is inspired by the signs and marks left by wildlife and other critters. This is a juried exhibition organized by Jim Sullivan. Sullivan is a local landscape painter, but also a long-time environmental activist and one of about 600 internationally certified animal trackers. The exhibition, which may be one of the first of its kind, was juried by Benjamin Benson, who is an environmental anthropologist and cultural ecologist, as well as an instructor at Santa Rosa Junior College. Animal tracking is considered both a skill and an art that entails storytelling, movement and visual markings. The field journals of animal trackers are usually marvelous works of art in themselves. The exhibition opens with a reception on Saturday, November 9, from 1 to 5:30 p.m. and will be on view through November 29. Workshops on tracking and bird language will be held at the Gallery and in other venues. There will also be tracking and bird language field trips to nearby sites lead by internationally certified trackers. RiskPress Gallery is located on Healdsburg Avenue in Sebastopol. For more information check their website, riskpress.com, or signsofpassage.com. Then the Occidental Center for the Arts is opening an exhibition of paintings by a stellar line-up of four significant Sonoma County artists. The show is called Paintings; the Work of Tony King, Jack Stuppin, Bill Wheeler, and Adam Wolpert. History and friendship run deep and long with these four painting buddies who have been painting together for decades. Not only that, but each of the four has made substantial achievements in their individual careers as celebrated artists, including shows in galleries and museums around the country, as well as the Sonoma County Museum. The history begins sometime around 1990 when Tony, Jack, Bill, and the late William Morehouse began painting outside together—collectively creating a large body of work and becoming known as the Sonoma Four. The culminating point for the group was the Cross Country Painting Tour. The road trip began in California and headed to New York, painting along the way. Eventually work from the tour was shown at The Century Club in New York City and was dedicated to the memory of Bill Morehouse, who died in 1993. After Morehouse’s passing, Adam Wolpert joined the group, which continued on for a while after that. And now these four are showing their work together for the first time. Primarily landscape painters, they each have their own distinctive style and approach to painting outdoors, but share a love and respect for the land and environment. And it is noteworthy that the exhibition takes place in Occidental, near where they live and the land and vistas that inspire them. Tony King is a nationally recognized artist whose work is exhibited by major museums and collections. After studying at Stanford in the 1960s, King moved to New York and began his career there as an abstract painter, before returning to Northern California to pursue landscape painting. Jack Stuppin is a graduate of Columbia College, in New York and studied painting at the San Francisco Art Institute. Jack has exhibited nationally in many solo and group shows. His paintings are held in public collections around the country, including the Oakland Museum. Bill Wheeler studied at Yale University and then at the San Francisco Art Institute with Richard Diebenkorn and Nathan Olivera. He has worked and exhibited in the San Francisco Bay Area for many years and lives on his infamous ranch in Occidental. Adam Wolpert is one of the founders of the Occidental Arts and Ecology Center, where he still lives and works. Wolpert completed an MFA at UC San Diego. He has had major gallery representation since 1988, including many solo exhibitions and group shows. The exhibition opens with a reception on Saturday, November 9, from 5 to 7 p.m., and will continue through January 5. For more information check their website, occidentalcenterforthearts.org. The current exhibition at Sebastopol Center for the Arts is called Innovations in Fiber Arts VI, and is the sixth in a series that takes place every other year at SCA. This exhibition is truly spectacular, not only because of how it was installed, but mostly because the work on display pushes the edges of what one usually thinks of as fiber art. The exhibition features thought-provoking, unconventional, and innovative fiber artworks that are expressed through a range of materials, including natural and fabricated fibers made of metal, paper, wood, and plastics, but also includes unexpected mediums such as photography, computer technology, as well as audio and video. While this exhibition still focuses on innovations in fiber art, there were some new changes for this year. One was to work in partnership with the Surface Design Association, whose vision is to encourage innovation and artistic excellence in textile-inspired art and design. The other change was to open the competition to artists outside the United States. The two Jurors, Susan Taber Avila, who is Professor of Design at U.C .Davis, and Joan Schulze, an international quilt, collage and fiber artist, selected 54 pieces out of 520 entries that came from all over the country and the world. The exhibition continues through November 30. For more information check their website sebarts.org. Then the new exhibition at Art Works Downtown, in San Rafael, is called Bob Nugent: Dialogues with Nature and brings together work from four different series by the artist that are being shown together for the first time. The nearly 30 pieces in the exhibition include large-scale paintings, flora drawings, works on wood veneer, and carved wood sculptures. Nugent’s work makes reference to his many years of travel in Brazil, specifically along the Amazon River Basin. Over this period of time Nugent has developed a large and diverse body of work referencing the unique natural environment that can be found there. The work speaks of Nugent’s insightful explorations and interest in specific places, and his ability to convey these impressions through his art in an evolving yet consistent manner. By suggesting imagery inspired by plant- and landforms, natural objects, insects, water and atmosphere, Nugent’s work reveals the essence, more than the actuality, of a fully rendered landscape. Through an understanding of its unique properties both perceivable and intangible, and using images, memories, and materials sourced from specific locations, the works reflect an intuitive depth of knowledge and awareness of place. Nugent is a Professor Emeritus from Sonoma State University, and is a recipient of a Fulbright Foundation Grant, and a National Endowment for the Arts Fellowship. His work is held in major museums and collections throughout the world. A reception for the artist will take place on Friday, November 8, from 5 to 8 p.m. The exhibition continues through November 22. For more information check their website, artworksdowntown.org. Every week SonomaArts.com posts my Best Bets in the Visual Arts audio blog. You can go to their website to hear the most recent posting. Below is an archive of the text from each previous posting. The new exhibition at the Marin Community Foundation, in Novato, is called Transmissions, and features work by 30 artists from around the country as well as the San Francisco Bay Area. According to the curator, Patricia Watts; “Transmissions are the electrical and chemical forces of energy that surround us daily.” These everyday experiences are mostly invisible and manifest primarily by way of sound, motion, and light. The artists in this exhibition, through both conceptual and representational artwork, provide visual evidence of forces such as fields of light, nuclear energy, chemtrails, electrical currents, weather events, telepathy, and sensations. They help bring to our awareness how we are inter-connected with what we see, breathe, and ingest, as well as sense, believe, and know. A public reception will be take place on Thursday, October 17 from 4:30 to 6:30 p.m. During the reception artist Dani Ohana Tull, from Los Angeles, will perform an ambient micro-tonal composition on the organ. The exhibition will be on view through January 24 in the Marin Community Foundation offices, which are located at number 5 Hamilton Landing, in Novato. For more information, check their website, marincf.org. Then at the Seager Gray Gallery, in Mill Valley, the current exhibition is called Form and Place, featuring glass and cast crystal sculpture by Jane Rosen and Ann Hollingsworth. Rosen creates life-sized bird shapes made of cast glass that demonstrate a deep, intuitive understanding of form and materials. Rosen’s work is well paired with Ann Hollingsworth’s elegant cast crystal nest forms. For Hollingsworth the fragility of material speaks to the tenuous state of endangered birds and the delicate nature of nests and nesting. Also on display are paintings and drawings of birds by Jane Rosen. The exhibition continues through November 10. For more information, check their website, seagergray.com. Lastly, at Paradise Ridge Winery, in Santa Rosa, the Spirit of the Man sculpture exhibition will be dedicating the new Temple of Remembrance. The ongoing sculpture exhibition opened in May 2012, and consists of 44 major sculptures set among oak groves and meadows. The original Temple of Remembrance, created by David Best, was burned in March 2013, in accordance with its intended life cycle, as a celebration of release and renewal. The new, all steel, temple incorporates David Best’s brilliant blending of imagery and design from various cultures. The permanent Temple of Remembrance is over 32 feet high and 25 feet in diameter. As time goes by the steel will react to wind and weather, and the welcomed addition of handwritten flags, photographs, and mementos will transform it with the passage of time. Come and experience the newest addition to the Paradise Ridge Winery sculpture meadow, and leave a memory or message. The dedication will take place on Sunday October 20, from 2 to 4 p.m. Paradise Ridge Winery is located on Thomas Lake Harris Drive, in Santa Rosa. ARTrails Open Studios begins this weekend. This will be a perfect time to get out in the beautiful fall weather, visit artist studios, and get inspired. ARTrails is produced by the Arts Council of Sonoma County, and this year features 160 artists. Touring open studios is an excellent opportunity to see where art is created, talk to the artists, and buy original, high quality artwork directly from the makers. The studios are located throughout Sonoma County so you may want to visit one of the galleries showing work of ARTrails artists to plan your self-guided tour. You can preview artwork at Wells Fargo Center for the Arts, Graton Gallery, Corrick’s Gallery in Santa Rosa, and Gallery One in Petaluma. You can also pick up one of the beautiful ARTrails catalogs that includes an artists’ directory, maps, and other good information, or go to their website, artrails.org. ARTrails open studios takes place during the next two weekends, October 12 and 13, and October 19 and 20, the studios are open from 10 a.m. to 5 p.m.
Then at Hammerfriar Gallery, in Healdsburg, the new exhibition is called Uncanny. . . Something To Chew On; paintings and sculpture by Art Moura. Using a rich earthy palette and a wide range of mostly found materials, Moura creates a world reminiscent of voodoo and dream time. He delves in fetishes, symbols and dark graphics to conjure up archetypal images that appear to exist someplace that is just on the edge of consciousness. The exhibition opens with a reception on Saturday, October 12, from 6 to 8 p.m., and continues through November 23. Hammerfriar Gallery is located at 132 Mill Street in Healdsburg. For more information check their website, hammerfriar.com. Lastly, the new exhibition at Marin Museum of Contemporary Art, in Novato, is Legends of The Bay Area, featuring the work of Robert Hudson. The exhibition includes sculptures, ceramics, and drawings by this legendary and local artist. A long-time Bay Area resident, Hudson was an integral part of the San Francisco Funk Art movement in the 1960s, and is a contemporary and longtime friend of Richard Shaw and William T. Wiley. Hudson’s sculptural assemblages make use of everyday and found objects. These incongruent objects and artifacts are combined to create visual harmonies that make visual sense when put together. Hudson lives in Cotati, where he continues to create work in his studio. The exhibition opens with a reception on Saturday, October 12, from 5 to 7 p.m. and will be on view through November 17. Hudson will give an Artist Talk on Saturday, October 19, from 2 to 3 p.m. MarinMOCA is located at 500 Palm Drive, Hamilton Air Field, in Novato. For more information check their website, marinmoca.org. Currently showing at the Santa Rosa Junior College art gallery is a powerful exhibition called Tradition of Mayhem. The work of eleven California artists in the exhibition addresses the ongoing themes of aggression, greed and hatred as elements found in human nature. Many of the works focus on individual and cultural destruction through implements of military, political, and corporate crimes and corruption. The artworks capture our engagement through well-developed aesthetics, craftsmanship, and conceptual presentation, and then confront us with choices of repulsion or the seductive appeal of violence and mayhem. The curator, Marna Hill, wrote in her statement that “The artworks speak with a brutal honesty and an often sublime beauty–some to animate our conscience, others to accuse, while some seek a pathway to healing.” Among the works in the show are prints by Art Hazelwood, sculptures by Bella Feldman, and Al Farrow, photography by Catherine Wagner, and paintings by Hanna Hannah, Sandow Birk, and others. The exhibition continues through to October 17. For more information check their website, santarosa.edu/artgallery. Next, the Sonoma County Museum is opening two new exhibitions. The first, Artistry in Wood continues a 25-year annual collaboration between the museum and the Sonoma County Woodworkers Association. Artistry in Wood, is the major showcase of fine regional craftsmanship, and includes work by artists from Sonoma County, as well as from Sacramento, Mendocino, San Diego, and other areas of California. This year’s jurors are Pat Kirkish, co-owner of Dovetail Collection, in Healdsburg, Elizabeth Lundburg, a woodturner from Benicia, and Jefferson Shallenberger, a furniture maker from Santa Cruz. Artistry in Wood will be on view through October 20. Then in another collaboration, this time with San Francisco Museum of Modern Art, the Sonoma County Museum is presenting Photography in Mexico: from the Collection of SFMOMA. With the temporary closure of SFMOMA for their expansion project, parts of their collection are travelling to other, regional venues. The benefit is the opportunity to see one of the world’s most distinguished collections of photography from Mexico without going to San Francisco. Approximately 100 photographs showcasing a rich and diverse tradition of photography in Mexico are on display. The exhibition begins with the 1910 Mexican Revolution, and culminates with the contemporary subjects of urban life and globalization. Included are not only works by Mexican photographers, such as Manuel Álvarez Bravo, but also excellent examples of work by Edward Weston and Tina Modotti, both of whom spent extended periods of time in Mexico. Organized by the San Francisco Museum of Modern Art, Photography in Mexico continues through January 12. A reception for both exhibitions will take place on Saturday, September 28, from 6:00 to 8:00 p.m. For more information about the exhibitions, related events and gallery talks, check their website sonomacountymuseum.org. The current exhibition in the Main Gallery at Sebastopol Center for the Arts is called ABZ Etcetera. This national juried exhibition investigates the use of written forms of communication, such as letters, numbers, symbols, calligraphy and text as they relate to the visual arts. The jurors, Donna Seager and Suzanne Gray from the Seager Gray Gallery in Mill Valley, selected work in a variety of media including painting, printmaking, photography, sculpture, fiber art, and handmade letterpress books. For the Best of Show award the jurors chose Open Book a mixed-media piece by Sandy Young. On the front surface of the piece is sheet of clear, glass-like material with hand written text—resembling the pages of an open book. From behind these clear pages an image of a young girl looks out innocently into the world. The jurors stated that they were drawn to this piece because of how “the materials, text and imagery are beautifully integrated.” Another award was given by the coordinators of the exhibition to Mark Brudzinski for his assemblage piece called House of Secrets. The piece includes a stack of old handwritten letters and envelopes enclosed in a wooden house-shaped structure. On the back wall of the structure are vague photographic images of an old house. We’ll never know what secrets are in those letters, but we can think about the writings that we may leave behind. Also showing at SCA, in Gallery II is Landscape Impressions, plein air oil paintings by Donna DeLaBriandais and figurative Sculptures in bronze and marble by Aaron Poovey. Then in Gallery III, is Illuminations in Ink, etchings and monotypes by Mary Prisland. Included in the exhibit is an Instructive description of the etching process with a display of tools and copper plates. All three exhibitions continue through October 19. Sebastopol Center for the Arts is located in the Veterans’ Building on High Street. For more information check their website, sebarts.org. Then, coming up this weekend is the beginning of the ARTrails open studios season. There will be a number of preview exhibitions around the area, but the main Preview Exhibition, the only one featuring all 160 artists, will be at the Wells Fargo Center for the Arts, in Santa Rosa. The show opens with a reception on Friday, September 20, from 6 to 9 p.m. and will run through October 25. The actual open studios will take place on October 12 and 13, and October 19 and 20. ARTrails is produced by the Arts Council of Sonoma County. For additional information, artists’ directory, and maps, pick up one of the beautiful catalogs or go to artrails.org. This weekend Atelier One in Graton is hosting their annual Open Studios. Atelier One is a complex of studios occupied by artists and other creative endeavors. The historic brick building had once been an apple drying factory and is now an irresistibly charming place with great artistic energy. However, this is a working place and during most of the year the studios and offices are busy places of creation and production. So this weekend is a rare opportunity to look inside the studios, talk with artists, see new work in progress, and buy some art. In the dozen or more studios you’ll be able to see and experience a variety of disciplines, including painting, sculpture, photography, printmaking, fiber art, and other innovative undertakings such as the Art Honors Life Gallery at Funeria. The event begins with a preview party on Friday, September 13, from 6 to 9 p.m. The evening will include refreshments, gourmet food trucks, and roving musicians. The studios will also be open Saturday and Sunday, September 14 and 15 from 11 a.m. to 6 p.m. Atelier One is located at 2860 Bowen Street in Graton. For more information and activity updates check their website, atelierone.blogspot.com. Then currently showing at the Hammerfriar Gallery, in Healdsburg, is Jann Nunn, Sculpture and Works on Paper. The central piece of the exhibition is called Arc of the Atlas. This narrow, nearly ten-foot tall piece is made of carved paper and suggests the form of a spinal column. Each end of the paper column is capped with a cast bronze component. The one at the top represents the atlas, which is the first vertebrae, the one at the base represents the sacrum. Jann Nunn, who lives and maintains a studio in Oakland, is also a professor of sculpture at Sonoma State University. Her work is exhibited internationally and throughout the United States, and currently can also be seen at the Paradise Ridge Sculpture Grove in Santa Rosa, and the ARC Gallery in San Francisco. A reception for the artist will take place on Saturday, September 14, from 6 to 9 p.m. The work will be on view through October 6. The Hammerfriar Gallery is located on Mill Street in Healdsburg. For more information check their website, hammerfriar.com. It’s back to school time and the new semester has begun at Sonoma State University. The first exhibition of the season in the University Art Gallery is called 25 Years, 25 Artists: The Painting Students of Mark Perlman. The exhibition honors Professor Perlman’s achievements as a teacher and mentor through the work of 25 of his most skillful and committed students. Perlman began teaching in the Art Department at SSU in 1988 and will be retiring this year. During those 25 years as a dedicated teacher Perlman influenced and inspired the lives and work of numerous students. The artists in the exhibition, who were former students at some point within that period, came from different backgrounds and developed distinctive styles of work. Many have gone on to advance their own careers as artists. Among those are Machiko Kondo, who teaches in the art department at Santa Rosa Junior College, and Frank Ryan who now lives and works in Los Angeles where he shows his acclaimed work in numerous galleries. The exhibition opens at the Sonoma State University Art Gallery with a reception on Thursday, September 5 from 4 to 6 p.m. and continues through October 13. For more information, please call (707) 664-2295. Then at Gallery 300 in Santa Rosa is a book launch and exhibition called Studio – 50 Sonoma County Artists. The project is an inspiration by local photographer Bob Cornelis. His idea was to do a series of black and white portraits and publish a book. In the summer of 2011 Cornelis began photographing artists in their studios. He felt the best way to represent an artist was in their creative space – their studio. The book profiles 50 visual artists from Sonoma County. In conjunction with the book Cornelis has created framed fine art prints of all the portraits in the book. These are on view in the exhibition. The book includes a stellar list of artists, which represents a sample of the rich diversity in the county. This can only be modified by saying that there could easily be another book of an additional 50 stellar Sonoma County artists. The book is augmented by 3 commissioned essays. The first is by artist Chester Arnold, and discusses his personal experience of the meaning and importance of the studio to the artist. The second, by Michael Schwager, who teaches and is the gallery director at Sonoma State University, is a survey and assessment of the regional art scene in Sonoma County. The third essay, by Jennifer Bethke, who teaches art history at Sonoma State, is on the subject of portraiture as an art genre. The book is being published in partnership with the Arts Council of Sonoma County and their organization, the Arts Education Alliance, which supports art programs in Sonoma County schools. All proceeds from book and print sales will be donated to this program. The book-launch and photography exhibition are celebrated with a reception on Saturday, September 7 from 5 to 8:30 p.m. Gallery 300 is located on South A Street in Santa Rosa. For more information about this project, go to the website, studio50artists.com. The new exhibition opening at Art Works Downtown, in San Rafael, is called Memento Mori. This fascinating exhibition is a street-art based installation featuring two unique Bay Area artists, Eddie Colla and D Young V. Memento Mori is a Latin term that refers to remembering the inevitability of death. The intention of the artists for this installation is to depict the end of the world juxtaposed to a new world rising of from the ashes; and a future reduced to the tasks of survival and memory. The exhibition includes individual work by the artists such as drawings and mixed media, but also features a number of collaborative pieces designed specifically for the gallery. The exhibition represents years of collaboration by the artists, both on the street and in galleries, and showcases their combined styles, ideas, influences, and perceptions. D Young V lives in San Francisco and received his MFA from the Academy of Art University. V’s work is shown in galleries, but also his murals can be seen throughout San Francisco, or on streets around the world. Most of his work deals with imagined post-apocalyptic issues ranging from pop culture, the military, and technology. Eddie Colla attended the School of Visual Arts in New York and graduated from the California College of Arts. His artistic career began as a photographer, which included working for the New York Times and various advertising agencies. Colla states that “There is a visual conversation that takes place on the streets of urban environments. This conversation is dominated primarily by advertising and utilitarian signage and assumes passive participation. Whether invited or not I am going to participate in this conversation.” This provocative exhibition will be on view from August 30 to October 11, with a reception for the artists on Friday, September 13, from 5 to 8 p.m. For information about the exhibition and related Gallery talks, check their website, artworksdowntown.org. For the next several weeks you will still have the opportunity to see the Richard Diebenkorn exhibition at the de Young Museum in San Francisco. 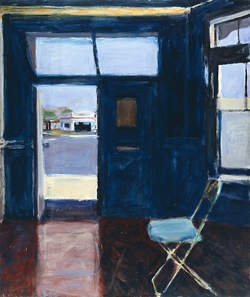 The exhibition, called The Berkeley Years, focuses on the period between 1953 and 1966 when Richard Diebenkorn lived and worked in Berkeley. The work and career of this pivotal artist needs to be noted for a number of reasons; including major contributions to American art during the mid-twentieth century, and perhaps more importantly, the recognition he brought to, and influences he had, on Bay Area art history. 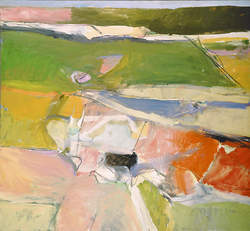 Diebenkorn was born in Portland, Oregon in 1922, but was raised in San Francisco. His career as an artist and teacher allowed him to live in various parts of the country, as well as Berkeley and Santa Monica. Then, in 1988, he and his wife moved to Healdsburg, where he lived and continued making art until his death in 1993. 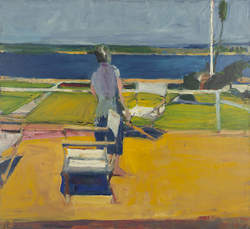 Diebenkorn played a prominent role in the development of the Bay Area Figurative movement, which evolved in the greater San Francisco area during the early 1950s. He, along with other early proponents, such as David Park and Elmer Bischoff, began incorporating representational and figurative subject matter into their paintings at a time when the predominant style was Abstract Expressionism. As a teacher in major Bay Area art schools, he also influenced the work of such important artist as Joan Brown and Manuel Neri. Eventually the Bay Area Figurative movement developed into one of the first distinctive styles to arise in Northern California and become nationally recognized in the wider art world. folding chair and open door imply human occupation and interaction. The more than 120 paintings, collages, and drawings in the exhibition include abstract imagery along with landscapes, figures, interiors, and still lifes. The exhibition continues through September 29. For more information about the exhibition and related programs check their website, famsf.org. The new exhibition at the Graton Gallery in downtown Graton is called The Pursuit of Happiness and features paintings by Susan Ratky Ball and fabric art by Frances Arnold. Susan’s landscape and still life paintings are inspired by the beauty and bounty of Sonoma County. The show includes some of her recent miniature oil paintings, which are small enough to hold in your hands for a close up view of rolling hills and rocky coastal views. As a nice counterpoint, Frances Arnold’s large textile pieces invoke the homespun process of stitchery. She uses fabrics such at cotton, hemp and linen, which she hand-dyes or paints, then stitches with simple and elegant forms, such as foxes, fish and trees. A Reception for the artists will take place on Sunday, August 18, from 2 p.m. to 5 p.m. The exhibition will be on view through September 22. For more information check their website gratongallery.com. Then, at Art Works Downtown, in San Rafael, the current exhibition is called Transitions. This juried exhibition focuses on photography-based artwork that considers the moments, locations, and conditions where transitions occur. The juror, Thom Sempere, who is an educator and the Executive Director at PhotoAlliance, selected the work of 32 Bay Area artists. The artwork on view reflects a variety of practices, including film and digital processes, and traditional as well as alternative materials and methods. The exhibition continues through August 23. For more information check their website artworksdowntown.org. Another photography exhibition is also on view in the gallery at Toby’s Feed Barn in Point Reyes Station. Called Exhibition 3D, the show features portraits and large-scale nature photographs by Art Rogers and John Kaufman. Both Rogers and Kaufman are long-time friends and professional photographers who have teamed up to create 3D stereoscopic style photographs. The process involves two photographs that were taken of the same scene from slightly different angles. 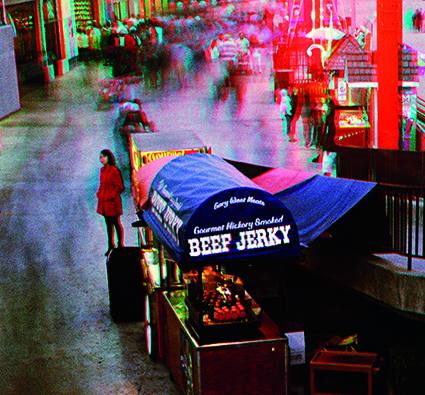 The negatives are digitally scanned and combined as red and cyan colored layers. The completed print, when viewed with special glasses, creates a stereoscopic image of the original scene. Art Rogers is known both locally and internationally for his black and white portraits and fine photographic craftsmanship. He often uses ultra-large format cameras to produce contact prints with significant detail. John Kaufman is recognized as one of the most influential figures in the development of holographic art. His pioneering work in the use of color in holography led to an international reputation. The gallery at Toby’s Feed Barn is located on Highway One in Point Reyes Station. The exhibition runs through August 28. For more information and to see some cool images from the show check their website tobysfeedbarn.com. Now that we are in mid-summer, it’s a good time to take a tour of Marin county galleries and museums, here are three to consider. The current exhibition at Seager Gray Gallery, in Mill Valley, is the Summer Salon. This group exhibition of eighteen select gallery artists represents a variety of media including paint, bronze, ceramics, thread, wood and altered books. Here are just some of the artists whose work you can see. Jessica Drenk cuts up and carves discarded books, which she then coats with wax. The finished forms resemble split logs or tree fragments. Lisa Kokin collects things like the spines from self-help books, buttons, or found photographs. She then stitches them together with thread, by hand or machine, and embellishes each piece with embroidery. Her work often combines socio-political commentary with a deep awareness of materials and processes. Nancy Legge creates elegant abstract figures in raku-fired porcelain that reflect the simple forms of ancient Cycladic sculptures. Carole Pierce’s oil-on-canvas paintings, in muted colors, depict the atmospheric quality of fog, clouds, and reflections on water. And Inez Storer delves into her personal as well as popular histories to produce large narrative mixed-media paintings. The exhibition continues through August 31. For more information check their website, seagergray.com. Then at Gallery Route One, in Point Reyes Station is their annual Box Show. With nearly 150 participating artists, the Box Show is the major fundraiser for the gallery. To be in the show, each of the artists received a box to work with, they could then do anything they wanted to the box, as long as part of the box remained in the final piece. Some of the creations became narrative vignettes within the box, and some were almost totally deconstructed. Then there are clever kinetics, game boards, as well as boxes that are painted, upholstered, or covered in plaster. The exhibition ends with a closing party and live auction on September 8. GRO is located on Hwy 1 in Point Reyes Station. For more information, or to view and bid on the art boxes, check their website, galleryrouteone.org. Finally, it’s worth a drive to the Bolinas Museum, in Bolinas, which is celebrating their 30-year anniversary. In the Main Gallery is, Keith Hansen: Birds of the Sierra Nevada. Hansen has been painting birds in his studio, which is located in the museum building, for over a decade. During that time he has created over a thousand meticulously detailed portraits of birds in graphite, watercolor, and color pencil. The Museum is showing a selection of his illustrations in this exhibition. The Marin Artists’ Gallery is showing Constructed Surfaces, photographs by Andy Rappaport. The photographs are inspired by the random items and markings left on public walls from around the world. Also on view in the museum are Selections from the Museum’s Permanent Collection. All exhibitions are on view through August 25. For more information check their website bolinasmuseum.org. The new exhibition in the Main Gallery at Sebastopol Center for the Arts is called Not Just Landscapes. The artwork on view examines a broad range of landscapes, such as city, water, and natural scenics, but also investigates visionary, futuristic and psychological landscapes. This national juried exhibition includes the work of over 70 local and regional artists selected by Mark Perlman, who is a professor of Studio Art at Sonoma State University. At the same time, SCA’s Gallery II is featuring Monoprints: Landscapes, Abstractions, Figures by Harry Frank. And in Gallery III, you’ll find The Art of Healing by Debbie Van Dyke. All three exhibitions open with a reception on Thursday August 1 from 6 to 7:30 p.m., and continue through September 7. For more information, check their website, sebarts.org. Then at Risk Press Gallery, in Sebastopol, the new exhibition on view is Reverse Image; The Printmaker’s Perspective. Curated by Sue Labouvie, the exhibition features 21 local artists, who work in traditional as well as experimental printmaking techniques. The array includes work printed on paper as well as unusual surfaces such as plaster and textiles. Many special events are scheduled to take place during the exhibition including poetry readings and demonstrations. For more information about events and gallery hours check their website, riskpress.com. Finally, the SOFA Arts District in Santa Rosa is the scene of numerous art events and experiences this weekend. For starters, it’s ArtWalk weekend, where twenty-four artists will have their studios open on Saturday, August 3, and Sunday August 4, from 11 a.m. to 5 p.m. You’ll be able to see everything from painting and sculpture to photography, printmaking and mixed media, all within walking distance. For information about ArtWalk check the website sofasantarosa.com. Then, about half a block to the north on South A Street, Gallery 300 is presenting the Golem Drone Project. This installation of ceramic figures, sgraffito tiles, and woodblock prints features the work of Todd Barricklow. With a touch of mythology and sinister humor, the project addresses the use of weapons that, while resembling large toy airplanes, were designed for lethal purposes. A reception for the artist is on Saturday, August 3, from 6 until 8 p.m. The exhibition continues through August 31. Gallery 300 is located at 300 South A Street, in Santa Rosa. For more information check their website, gallery-300.com. There are three galleries in Sonoma, Marin and Napa counties that are featuring sculpture and craft-based artworks right now. First, the current exhibition at Healdsburg Center for the Arts is called Clay and Glass; an Invitational Exhibition of Contemporary Ceramics and Glass. Nearly twenty artists were invited to participate in the exhibition based on their professional accomplishments in ceramic or glass art. On display you’ll see both sculptural pieces as well as functional ones, including ceramic sculpture by Jennifer Brazelton, ceramic vessels by Liz Crain, elegant fruit shapes made of glass by Mitch LaPlante, and botanical glass forms by Kim Webster. The exhibition will be on view through August 23. The Art Center is located at 130 Plaza Street in Healdsburg. For more information check their website, healdsburgcenterforthearts.com. Then at Falkirk Cultural Center in San Rafael, the current exhibition is called Splendid Objects. The exhibition features craft-based artwork in wood, ceramics, glass, metal, and painting. The nineteen participating artists were chosen by the curator, Kathleen Hanna, for their highly developed “design sense”, which she describes as “a knowledge of materials and tools, and a vision of the possibilities they offer.” Some of the work you’ll see includes hand-carved glass by Jean Salatino and Steven Gandolfo, large-scale ceramic basins by Suki Diamond, Gary Marsh’s graceful creature-forms made of clay, and furniture by Tripp Carpenter as well as Alison McLennan. The exhibition continues through August 17. Falkirk Cultural Center is located on Mission Avenue at “E” Street, in San Rafael. For more information check their website, falkirkculturalcenter.org. Finally at di Rosa, in Napa, the new exhibition in the Gatehouse Gallery is called External Combustion: Four Sacramento Sculptors. Organized by guest curator, Renny Pritikin, the exhibition showcases the work of four contemporary sculptors from the Sacramento area. The artists, Nathan Cordero, Julia Couzens, Chris Daubert, and Dave Lane—all in their own fashion—make use of humble, found, or industrial materials to create work that ranges from large-scale and wall-mounted sculpture to interactive works, and site-specific installations. What connects these artists is their tendency toward creating artwork that possesses a raw, unrefined beauty, and the referencing of art history and contemporary culture through conceptual approaches. There will be a panel discussion with the artists on Wednesday, August 14 at 7 p.m. The exhibition will be on view through September 22. For more information check their website, dirosaart.org. The new exhibition at Risk Press Gallery, in Sebastopol is called Words Fall Away. This retrospective exhibition features the work of Claude Smith, and includes paintings and monotypes created by Smith over the last fifteen years. The work addresses philosophical questions about language as expressed through written, spoken and unspoken words. Through his art Smith processes abstract concepts in visual mark-making terms. His style possesses a sophisticated depth that reflects his life-long involvement with art. Smith was born in NYC, and grew up in a family of artists. His formal training began at the age of 13 when he took classes at the Art Students League in New York, as well as the School of Visual Arts, and Pratt Institute where he earned his BFA. Smith moved to Northern California in the early 1980s where he still maintains his residence and studio. Smith has shown his work throughout the country and Europe, and has recently been an artist-in-residence at KALA Art Institute in Berkeley. There will be a reception for the artist on Saturday, July 13 from 5 to 8 p.m. Other events taking place during the exhibition include an artist talk on Thursday, July 18, at 11 a.m. and 7 p.m. and an evening of music with guitarist Richard Osborn on Saturday, July 27, at 7:30 p.m. The exhibition will be on view through July 28. RiskPress Gallery is located on Healdsburg Avenue in Sebastopol. For more information check their website riskpress.com. The new exhibition at Sonoma Valley Museum is called Akin: The Art of Nicole and Marc Katano. The exhibition pairs the work of two artists, a painter and a photographer, who have shared life and creativity together for many years. Nicole’s photography isolates tiny fragments of shapes and textures from the natural world. By paying equal attention to the shapes along with the spaces in between—the soft focus images encourage a mood of contemplation and observation. She often arranges multiple related images in a horizontal format, suggesting the structure of Japanese scrolls. Marc’s paintings are inspired by Japanese calligraphy. The abstract compositions imply the physicality of human expression through the simple act of mark-making. The lines move in harmony, creating nonverbal meanings through their relationship to each other, and the spaces in between. Each is an accomplished artist with a distinctive style, yet viewed together, their work reveals a depth and dialog between the two. Nicole’s work begins with forms in nature that move toward abstraction. Marc’s work begins with abstract movements that hint at organic forms found in nature. The exhibition opens on June 29 and continues through August 25. Sonoma Valley Museum is located on Broadway in the town of Sonoma. For more information and a program of related events check their website, svma.org. Then in Sebastopol, the exciting news is the grand opening of a new art gallery. The CounterCulture Art Haus Gallery opens with a big celebration on Saturday June 29 from 3 to 10 p.m. There will be live music, wine, and food, with painting and dance performances throughout the afternoon and evening. The gallery plans to focus on fine art, jewelry, crafts and prints. Some of the featured artists include Stanley Mouse, Ron Rodgers, Heather Caulfield, Jud Smith, Craig Mitchell, and others. The gallery is located at 6780 Depot Street, and is part of the Barlow complex. Their website, which appears to still be under construction, states that this is Where Art Lives, and that they believe that art can change the world. Their goal is to share that vision by presenting art created by artists with a passion for uplifting their environment through their creations. Sounds like a good thing to support. For more information call 707-827-3020, or try their website, countercultureart.com. The new exhibition at Sebastopol Center for the Arts is called Up Up and Away and features artwork that expresses or investigates various aspects of flight. The juror, Katie Curler, an experienced curator who works at Blue Line Arts in Roseville, selected 62 pieces for the exhibition. The selection represents a variety of interpretations of the theme. One category includes such things as birds, balloons, flying machines, and floating teddy bears. A couple in this area that caught my attention was a pair of small photographs by Jerry Cohen. Taken just as large flocks of birds were startled up in flight; the flutter of many tiny black wings creates a pattern of abstract shapes. Another stand-out is Monty Monty’s flying contraption, which hangs from cables in the entryway. The piece, called Big Boy, is assembled from a collection of vintage objects, including copper kettles, spoons, and a large bow saw for wings. The exhibition also includes work that expresses psychological and emotional connections to flight. A good example in this category is Contact, a mixed-media painting by John James. The painting depicts a small boy in various poses playing with his toy airplane, and illustrates the boy’s imaginative process as he “soars” through the air. However, my top favorite was an oil painting called Early Morning Drama, by Bob Lee Hickson. This skillfully painted picture shows the Casino Bar and restaurant in the town of Bodega. The early morning fog is lifting, and lights from neon signs are reflected off the damp pavement. But then, flying in a sudden swift swirl before the tranquil scene comes the early morning drama—a sloshing cup of coffee chases two fried eggs with bacon, that are trying to catch up with a spoon and empty plate, which is about to spin off the canvas. It made me laugh and wonder. And you still have time to catch the show. Up Up and Away will be on view through July 20. For more information, check their website, sebarts.org. Then at Paradise Ridge Winery, in Santa Rosa, is the re-opening of The Spirit of the Man sculpture exhibition. More than an art exhibition, The Spirit of the Man honors the life and work of art patron Al Voigt, who was co-founder of the Voigt Family Sculpture Foundation. Al’s vision helped expand the quality and quantity of public art in Northern California. The two-year long exhibition opened in May of last year, and is being re-dedicated with several new pieces. The show features 38 major works by sculptors from Sonoma County, California, and throughout the United States. One new addition is a monumental piece by the late Robert Ellison. Called Four Times Daily, the huge, amazing piece has been restored and situated on a bluff above the winery grounds. The re-opening Celebration, with music and food, takes place Sunday, June 23 from 12 to 4 p.m. Paradise Ridge Winery is located on Thomas Lake Harris Drive, in Santa Rosa. For more information check the website, thespiritoftheman.com. Occasionally there are groups of artists in our communities that don’t receive the recognition they deserve. In the case of Artists with Disabilities, a number of exhibitions in the area this summer are showcasing this sometimes overlooked group. First, the Sonoma County Museum, in Santa Rosa, presents Margins to Mainstream: Contemporary Artists with Disabilities. The featured artists, both local and international, are associated with organizations that provide programs for disabled artists. The organizations involved are the Creative Growth Art Center in Oakland, AbleArt, the National Alliance on Mental Illness, Wellness and Advocacy Center, and Becoming Independent in Santa Rosa. The art includes works on paper, fiber art, ceramics, and video, as well as a selection of work by Sonoma County artist, Rodger Warnecke. In conjunction with the exhibition, the Museum is hosting a lineup of events taking place throughout the summer that are intended to broaden community awareness, understanding and appreciation. The exhibition opens with a reception on Saturday, June 15, from 4 to 6 pm, and continues through September 15. For more information about the exhibition and a list of all the public programs, check their website sonomacountymuseum.org. Next, opening at the Marin Community Foundation in Novato, is an exhibition called Breaking Barriers: Bay Area Artists with Disabilities. Organized by independent curator Patricia Watts, the exhibition features approximately 130 paintings and sculptures by artists with physical and mental disabilities. The artists are represented by six Bay Area organizations that serve artists with disabilities including, Becoming Independent in Santa Rosa, Creativity Explored in San Francisco, Creative Growth Art Center in Oakland, National Institute of Art and Disabilities in Richmond, Brain Injury Network in Larkspur, and The Cedars of Marin in Ross. For those who struggle to find outlets of expression due to physical or mental limitations, creating art is a way to interact with the world without the barriers of artistic critique. A reception for the artists will take place on Wednesday, June 19 from 4:30 to 6:30 pm. The exhibition will continue through September 27. Marin Community Foundation is located at number 5 Hamilton Landing, Suite 200, at the Hamilton Air Field in Novato. For more information, check their website, marincf.org. Then in July, the Petaluma Arts Center presents Undercover Genius: The Creative Lives of Artists with Disabilities. The exhibition will feature dynamic work from artists involved in the creative art programs at Becoming Independent, in Santa Rosa, Cedars of Marin in Ross, the National Institute of Art and Disabilities in Richmond, Creative Growth Art Center in Oakland, Creativity Explored in San Francisco, Alchemia and The Open Studio at Old Adobe Developmental Services in Petaluma. The exhibition will also include selected works from independent artists, Zoe Petersen, Monique Harris, and Lisa Bufano. The art studio for people with disabilities is a place of freedom that strives to eliminate judgment and competitiveness, placing value on the individual’s growth and expression. Works will include painting, sculpture, ceramics, fiber art, prints, and mixed media. The exhibition will open with a Reception on Saturday, July 13, from 4 to 6 pm, and will continue through September 15. During the exhibition Petaluma Arts Center will offer community art-making workshops led by artists with disabilities. For more information check their website, petalumaartscenter.org. A very special exhibition is opening this weekend at Occidental Center for the Arts called Fiber, Folkwear, Funk & Flash: Fifty Years with Alexandra Jacopetti Hart. This retrospective exhibition features the work of local artist, author, and community activist, Alexandra Hart. Over the years Alexandra has added many credits to her name. Aside from her career as a fiber artist she is the author of Native Funk & Flash, first published in 1974. She’s also a co-founder of the Folkwear Pattern Company. The exhibition includes iconic embroidered pieces that were featured in the original Native Funk & Flash book, wearable art she designed for Folkwear Patterns, as well as her more recent tapestries and silver beaded jewelry. The event also celebrates the re-issue of her book, Native Funk & Flash, with previously unpublished material. I had the pleasure of chatting with Alexandra about her upcoming exhibition. Click this link to hear the interview. https://satripencak.files.wordpress.com/2012/08/sp-41113-shess-bbsoarts.mp3 The exhibition opens with a reception on Friday, June 7 at 6 p.m., followed by a book launch party at 7:30 p.m. Then on Sunday, June 23, from 4 to 6 pm, there will be a showing of two films, “The Saga of Macramé Park” and “The Trips Festival”, followed by discussions with Alexandra and special guests. The exhibition will be on view through July 7. Occidental Center for the Arts is located on Bohemian Highway in Occidental, for more information check their website, occidentalcenterforthearts.org. There’s a galaxy of art events going on in the area right now, so I’ll just mention a few. First, for western Sonoma County, this Saturday begins the first of two Art at the Source Open Studios weekends. Sponsored by Sebastopol Center for the Arts, this year’s event invites you to 98 studios, featuring the work of 160 artists. A number of the artists are offering free demonstrations throughout the weekends where you can observe and learn about traditional and experimental materials and techniques. The Open Studios events take place Saturday and Sunday June 1 and 2, as well as on June 8 and 9. The artist studios are open from 10 a.m. to 5 p.m. For information, maps, demonstration schedules, and locations of preview exhibitions visit the website, artartthesource.org. Then the Sonoma County Museum, in Santa Rosa, is showing Cross Currents. This exhibition of contemporary prints is in conjunction with the Matsuri Japanese Arts Festival. The artists in this exhibition depict a unique fusion between Eastern and Western aesthetics and printmaking traditions. Most of the work on view comes from the Ren Brown Collection, in Bodega Bay, and includes the work of Christopher Dewees, Chiyomi Longo, Mayumi Oda, Micah Schwaberow, Hiroshi Yoshida, Seiko Tachibana, and others. The exhibition opens with a reception on Thursday, May 30 from 6 to 8 p.m., and runs through June 9. Matsuri is an annual arts festival celebrating the culture and food of Japan. The festival takes place in Julliard Park in Santa Rosa, as well as inside participating studios in the South A Street Arts District, on Saturday, June 1, from 11:00 a.m. to 5:00 p.m. For more information check their website, sonomamatsuri.com. Finally, the new exhibition opening at the Hammerfriar Gallery in Healdsburg is called The Summer of 2013. The exhibition features abstract oil paintings by Harley, figurative sculpture by Bill Shelley, ceramic sculpture by Brian Wilson, and an amazing sound installation by Hugh Livingston. This installation, called Points of View: Russian River, consists of video, audio and photographs planned in conjunction with the composition and ecological ideas behind the River Opera, which will be performed at the Warnecke Ranch and Vineyards on August 10. The exhibition opens with a reception on June 1, from 6 to 9 p.m., and will continue through August 11. For more information about the exhibition and the performance, check their website, hammerfriar.com. It’s marvelous to have such a wide diversity of visual art experiences right here in Sonoma County. First, the current exhibition at the Annex Galleries in Santa Rosa features traditional but beautiful works by the late William Seltzer Rice. Rice, who lived from 1873 to 1963, was primarily known as a painter and printmaker. The forty-four watercolors, intaglio and block prints offer a good representation of the mastery of his skills. After growing up and being trained in the arts on the East Coast Rice moved to the East Bay in 1910. There he earned his BFA from the California College of Arts and Crafts, taught art in the local schools, and lived until his death in 1963. Rice captured the natural beauty of Northern California in his watercolors, including locations such as Cazadero, Healdsburg, the Russian River, Marin, and San Francisco, which are on display in the exhibition. Rice had the opportunity to see Japanese woodcuts during the 1915 Panama Pacific International Exhibition, in San Francisco. The compositions and techniques he observed very much influenced his printmaking. And in 1917 the Oakland Museum of California, then called the Oakland Art Gallery, featured a solo exhibition of his color woodcuts. Rice’s work can be found in numerous esteemed public collections in the country, including the Fine Arts Museums of San Francisco, Oakland Museum of California, Museum of Fine Arts Boston, Smithsonian American Art Museum, as well as the Sonoma County Museum. This is an excellent opportunity to see the work of an American master watercolorist and printmaker. The show will be on view through June 29. The Annex Gallery is located at 604 College Avenue in Santa Rosa. For more information check their website, annexgalleries.com. Then something much more fleeting and out-of-the-ordinary is the one day art event in Santa Rosa called Out of Order. Organized by Roman D’Argenzio, the event will take place in a vacant warehouse in downtown Santa Rosa for one day only, on Saturday May 25. Known for his “Kaleidoscope” pop-up art events that occurred over the past few years, D’Argenzio is motivated to show the community how talented our local artists are. This free exhibition of work by more than 40 artists, mostly from Sonoma County, will include murals painted directly on the inside walls, as well as sculptures and installations. One of the artists involved is Ricky Watts, who recently painted the large outdoor mural on the southern wall of the Phoenix Theater in Petaluma. The Out of Order event will take place from 4:30 pm to midnight on Saturday, May 25, at the former Santa Rosa Printing building located at 575 Ross St., in Santa Rosa. It’s free, it’s fleeting, it’s going to be fun, so you gotta be there or you’ll miss it. This week is the kick off for Art at the Source Open Studios with Preview Exhibitions taking place around town. Art at the Source is sponsored by Sebastopol Center for the Arts, and is Sonoma County’s premiere summertime open studios event. This year’s annual tour features 160 artists in 98 studio locations, and includes a wide assortment of media from painting and sculpture to jewelry and fiber art, as well as everything in between. A good way to get an overview of this marvelous diversity, and to help plan your tour, is to visit one of the venues hosting an Art at the Source Preview Exhibition. The best place to begin is at Sebastopol Center for the Arts, where each of the artists is represented with a piece in the gallery. The exhibition opens with a reception on Thursday, May 16 from 6 to 8 p.m. and will remain on view at SCA until June 9. Other locations for preview exhibitions include Gallery One in Petaluma, the Sebastopol Gallery, and the Finley Center in Santa Rosa. The dates and times vary for these other locations, so for more detailed information go to either of these two websites, artatthesource.org, or sebarts.org. Another invaluable guide is the Art at the Source 2013 catalog which is loaded with information about the artists, their studio locations, demonstration schedules, and maps. The catalog can be picked up at any of the preview venues and many other locations around town. The actual Open Studios will take place during the first two weekends in June. Then, showing at Gallery 300 in Santa Rosa, are Woodgrain Paintings by Mary Jarvis. In this new series of oil paintings on canvas, Jarvis combines areas of intense color with hard-edged lines to form patterns reminiscent of wood grain. The source of inspiration for these tree-based images comes from her early years spent growing up in a hand-hewn family home near Lake Superior. While the wood patterns are rendered with realism, she applies unexpected colors to the flat organic shapes, thus creating vibrant abstract compositions. The exhibition continues through May 28. Gallery 300 is located on A Street in Santa Rosa’s SOFA arts district. For more information, please visit their website, gallery300.com. The current exhibition in the Gatehouse Gallery at di Rosa, in Napa, is titled From Two Worlds. The exhibition consists of over 30 photographs by Bay Area artist, Linda Conner, and is presented in two segments, each telling its own story. The first part is called “Dark Forces” and deals with Connor’s experiences of visiting and photographing monasteries in Tibet and Northern India. The large- scale photographs reveal that even through the ravages of time and desecration from the Cultural Revolution, the images of fierce guardians and sacred deities retain their power and presence, transcending time and politics. For Conner, the work is a celebration of mystery, where ancient ritual and imagery still evoke a visceral experience. The second part of the exhibition is called “The Olson House”. The house, which is located in coastal Maine, was brought to notoriety by the artist, Andrew Wyeth, who painted there often for over thirty years. The Cincinnati Art Museum commissioned Conner to photograph the site in 2006 and included her images as part of an exhibition of Wyeth’s watercolors and drawings of the house and its owners. One of Wyeth’s most famous paintings from the 1940s is called Christina’s World, and portrays the physically challenged Christina Olson slowly making her way up a hill to the Olson house. Conner’s images of the setting, the house, and the interior spaces are devoid of human presence yet make reference to the people who lived and visited there. And, while Connor pays homage to the history, her photographs are enlivened through the way she captures passing light in the present moment, which animates the silent objects with a contemporary freshness. Though the two segments of the exhibition represent two very different Worlds, the similarity lies in the contrast of what happens when deep history is re-contextualized from the perspective of present time. Linda Connor is a professor at the San Francisco Art Institute and the recipient of a Guggenheim fellowship and three grants from the National Endowment for the Arts. She will present an Artist Talk at the Gatehouse on Wednesday, May 29 at 7 p.m. The exhibition continues through June 30. For more information check their website, dirosaart.org. Then the Headlands Center for the Arts, at Fort Barry in Sausalito, is featuring an exhibition called Present Tense. The exhibition showcases new works by recent Graduate Fellows created during their year-long studio residencies. The work of each of the seven artists’ deals with the prevalent natural and cultural history found within the landscape of the Headlands—but is uniquely translated through each of their chosen media. The various contemporary narratives are presented through experimental studio practices in sculpture, photography, printmaking, painting, and installations that are staged in and around the building. The exhibition runs through June 9. For more information and directions check their website, headlands.org. The new exhibition at Risk Press Gallery in Sebastopol is called On The Edge, a selection of abstract paintings and drawings by Bernadette Howard. Inspired, in part, by a recent visit to Alaska, the abstract imagery is a response to current environmental issues such as climate change, water depletion, land use, and sustainability. In a process that is intuitive, emotional and physical, Howard begins by creating the grounds; which means mixing pigments in either acrylic or oil media. She then physically manipulates the grounds on the surface through a method of additions and subtractions. Howard states that she is always awed and inspired by the transmutation and synergy that occurs as the medium and the surface interact. The exhibition opens with a reception on Saturday, May 4, 5 to 8 p.m., and continues through May 26. For more information check their website, riskpress.com. Next, our local institutions of higher education offer some good choices. Starting with Sonoma State University, where currently on view in the University Art Gallery is the 2013 BFA Exhibition. This show features the work of fifteen graduates from the Bachelor of Fine Arts program. From traditional to edgy, this is a chance to see the range and caliber of work being produced at SSU, in painting, printmaking, video, mixed-media, and sculpture. Also at SSU, in the Library Art Gallery is an exhibition called, Or The Sea: Experiments in New Media. This exhibition features work by nine students of the New Media art class. Using a variety of contemporary media such as sound, video, digital photography, and performance, the artworks take a look at water from a variety of angles, ranging from its physical characteristics, to political issues, religious symbolism, and poetic metaphors. The exhibition is part of the yearlong campus-wide initiative called, Water Works, which explores inland water-flow as a resource, theme, and symbol. Both exhibitions continue through May 11. For information about parking and gallery hours, check their website sonoma.edu. Then, at Santa Rosa Junior College, a fabulous new permanent art collection has been installed in the Doyle Library. The Doyle Collection consists of art works created by past and present SRJC faculty and staff members. The Santa Rosa JC is known for its outstanding art department, where both the full-time faculty and adjunct instructors bring high levels of skills and accomplishments to the classroom as well as the greater art world. The eighty artworks represent faculty and staff from the Art Department as well as other campus departments. While it’s a treat to see work by current faculty and staff, some of the highlights are pieces by artists from the past, such as Max Hein, Elizabeth Quandt, Larry Thomas, John LeBaron, Maurice Lapp, Paul Beattie, and Robert Arneson, who apparently taught there from 1958 to 1959. The project was conceived and organized by Scott Lipanovich, a library employee, and it took over two years to gather the mostly donated artworks. The Doyle Library also houses the Agrella Art Gallery, where the annual Student Art Show is currently on view through May 16. For more information check their website santarosa.edu. Often old but indelible memories can be the inspiration for creating new artwork. There are two current exhibitions in the area that reflect on past experiences. The new show at the Graton Gallery, in downtown Graton is called A Look Back; New Work by Rik Olson. While that may sound contradictory, Olson’s new works are wood and linoleum block prints that he has recently created from photographs taken during his travels in Europe a number of years back. Many of the ten or so works capture a passing moment in time that has now become timeless. In creating the blocks for the prints, Olson simplified the compositions and included only the elements that convey that special moment, giving them a contemporary freshness. During our conversation about his print called The Look, Olson relayed that while he was setting up to photograph a beautiful ancient doorway in Germany, a young boy darted into the entryway to hide from his pals. Olson caught the boy peering around the door jamb with a look of sly anticipation. The resulting print portrays a marvelous contrast between the static nature of historic architecture, and the fleeting, in-the-moment, antics of a young boy hiding in the shadows. The exhibition continues through May 19. For more information check their website, gratongallery.com. With the passage of time childhood memories can merge with dreams and stories told by others yet remain very powerful. 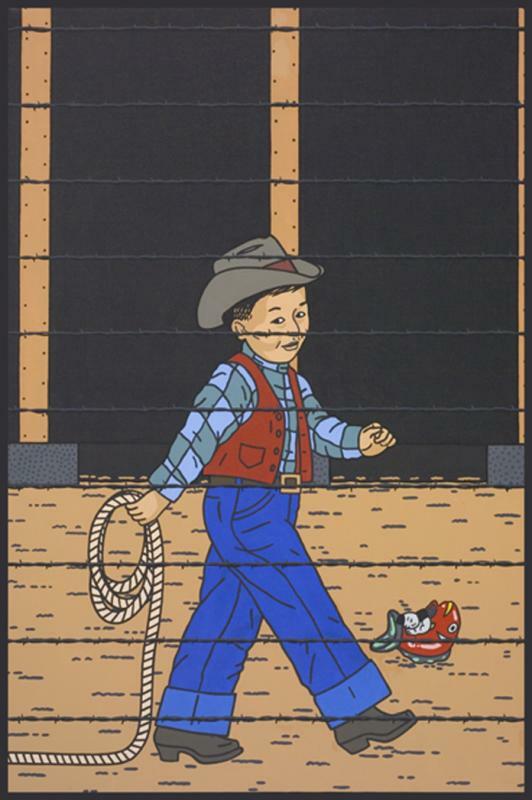 In this way, Roger Shimomura employs his memories to create powerful visual imagery. The current exhibition at Sonoma Valley Museum of Art features paintings and lithographs representing snippets of Shimomura’s remembrances from the years he was detained as a child in Minidoka, a World War II relocation camp located in Idaho one of many relocation camps for Japanese Americans during that time. Addressing socio-political issues of ethnicity and discrimination, Shimomura brings together visual aspects of Japanese style ukiyo-e prints with western style pop art in his work. This combination points out the vague and uncertain border of where one culture ends and another begins. In the tradition of Lichtenstein, Warhol, and Teraoka, Shimomura captures our attention by depicting visually appealing images through the use of cartoon characters or historical figures. This is particularly evident in a painting titled Classmates. Here, two teenage girls stand together in their nice school dresses. They look so much alike—best friends—smiling, munching on shiny red apples. However, one girl is blond, the other, with black hair, stands behind a barbed wire fence. The message is quite chilling. Roger Shimomura. American Alien, #4, 2007. Courtesy Sonoma Valley Museum of Art. Throughout his forty-year career as an artist and teacher, Shimomura’s work has been driven by a variety of historical and political events, including the status of Asian Americans in the U.S. after WWII, stereotyping, and ongoing employment and housing discrimination. By combining common everyday themes with incongruous, iconic elements of both Western and Eastern cultures, Shimomura creates powerful racially charged images. Through his art Shimomura strives to portray what he considers to be the abuse of ethnicity and the continuing undertones of racism in American culture. Roger Shimomura: Minidoka on My Mind is on view at Sonoma Valley Museum of Art in Sonoma, California through June 16, 2013. Satri Pencak is an independent curator and writes art reviews and essays for two blogs. Areas of special interest include art as it intersects with science, social issues, and multiple disciplines. She served as Director of Exhibitions at Sebastopol Center for the Arts from 2000 to 2011. 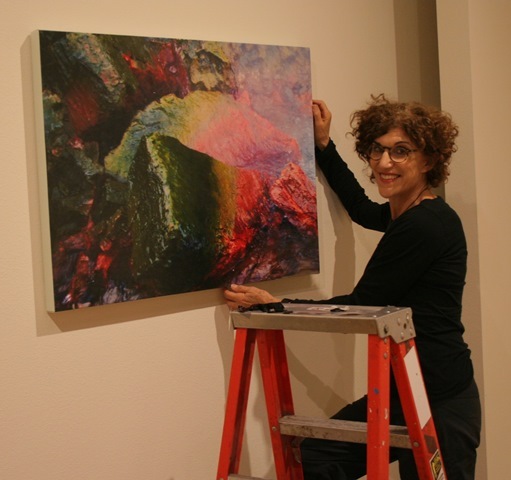 The new exhibition at the Petaluma Art Center is called Cosmic Terrain. This unique street-art-style exhibition includes the work of four artists. Featured in the Art Center galleries are collaborations and individual work by Mario Mars-1, Damon Soule, and Oliver Vernon. And on the South wall of the Phoenix Theater, in Petaluma, is a freshly completed large-scale mural by Ricky Watts. What unites these artists is their early beginnings and influences from graffiti and street art. While maintaining their personal philosophies, and the in-the-moment freshness of a more covert practice, their art has evolved into a remarkable and refined style. I had the opportunity to chat with Scott Hess, who is the curator for this exhibition. Click link to hear the interview. https://satripencak.files.wordpress.com/2012/08/sp-41113-shess-bbsoarts.mp3 A reception for the artists will take place on Saturday, April 13, from 4 to 6 p.m. The exhibition in the gallery continues through June 2. The mural on the Phoenix Theater, which is located on Washington Street, in Petaluma, will be there indefinitely. For more information check their website, petalumaartscenter.org. There are two new shows opening at Sebastopol Center for the Arts. In the Main Gallery is Flower Power, a national juried exhibition featuring work that has Flowers as its central subject. I happened to be the juror for this show, and had the honor of viewing over 260 artworks, and then the task of selecting about 110 pieces to be exhibited. I felt that an interesting exhibition would show balance and diversity in how the theme was expressed. To achieve that, I set out to select a variety of styles, media, and approaches to the theme of Flowers. Liz Sher installing her show at SCA. Currently showing at Gallery Route One, in Point Reyes Station is an exhibition of work by Richard Lang and Judith Selby Lang. The show is called The True Cost of Plastic, and is part of a larger, ongoing collaborative project by the artists. The Lang’s have been visiting a particular segment of Kehoe Beach, in the Point Reyes National Sea Shore, since 1999. During their beachcombing they gather plastic debris that has been washed up on the shore from the Pacific Ocean. The process has become an amazing journey for them. They approach their work like archeologists, noting that each ‘finding’ has its own story to tell, as well as contributing to the bigger picture of human history and the ‘throw-away’ culture. The Lang’s carefully examine and sort the bits of plastic refuse, then use it to create works of art. With minimum modification, the pieces are arranged into abstract or narrative compositions, which are then photographed and printed. The resulting colorful images can be deceptive in their beauty and matter-of-fact presentation. While being drawn into the design and assortment of objects, the deeper meanings begin to arise. Thoughts begin to surface, such as the Great Pacific Garbage Patch, or the various threats to marine life, and the fact that plastic never goes away. I am reminded of the article ‘Polymers Are Forever’ published in Orion Magazine. The article talks about how plastic doesn’t bio-degrade, but breaks down into tiny nurdles that are getting into our food chain. The first exhibition from this project, titled One Year, One Beach, was exhibited at Gallery Route One in 2001. After that things really took off for the Langs. With over 50 exhibitions to date, their work has been shown in cities throughout the United States and Europe. They currently have work on view at the Marine Mammal Center, in Sausalito. In June, they will have a permanent display in the Natural Sciences department of the Oakland Museum. Thirteen years after that first show, stuff keeps washing up, and the Lang’s are still energized by the task of picking up trash. The current exhibition, The True Cost of Plastic, takes on a more somber tone about complex issues. Over the years they have amassed a collection of plastic toy soldiers. Looking at these, the artists said that, “Wracked by a long life at sea, some of the faces are gnarled, [and] abraded by the sand. When we looked into the tiny faces we were amazed by their expressions. Each soldier is a poignant reminder of the ravages of war and the extremes to which nations will go to preserve dominion over the petrochemical world.” The exhibition includes large-scale photographs of toy soldiers, a re-enactment of a battle scene, and some rare and amazing pieces of plastic they have collected. Also showing at G R O are paintings by Dorothy Nissen, and photography by Eric Engstrom. The exhibitions continue through April 28, Gallery Route One is located on Highway One, in Point Reyes Station. For more information check their website, galleryrouteone.org. To learn more about the Lang’s, go to their website, beachplastic.com. Starting in Sebastopol, the current exhibition at Risk Press Gallery is called Faces, Fates and Destinies, work by Phil Hettema. The oil paintings and drawings on view depict portraits, figurative compositions, landscapes, and still life arrangements, both real and imagined. The word ‘imagine’ is key, since Phil began his career as a designer for Disneyland and Walt Disney World. He then founded The Hettema Group, which is a major design studio in Southern California. The group designs projects for global theme parks, and highly visible worldwide events. Risk Press Gallery is located on Healdsburg Avenue, in Sebastopol. The exhibition continues through March 30. For more information check their website, riskpress.com. Then, currently on view at the Petaluma Arts Center is, Art Shapes the World: A Youth Arts Exhibition. The show is in conjunction with National Youth Arts Month, which gives students, grades K through 12, the chance to exhibit their artwork in a professional setting, as well as to be recognized for their creative achievements. One of the primary goals of the National Youth Arts Month program is to emphasize the importance that every child should have the opportunity to participate in creating art. This is critical to a growing person, because the process of creative exploration and experimentation helps develop general problem-solving skills, leads to greater self-esteem, and helps prepare young people for a lifelong appreciation of all the arts. Petaluma’s first annual Youth Arts exhibition includes over 70 pieces in a variety of media by students from local schools. The exhibition continues through March 29. For more information check their website petalumaartscenter.org. Another student art show, but at a different level, is the Juried Student Exhibition, currently on view at the Sonoma State University Art Gallery. The show includes over 50 artworks in a variety of media, such as painting, sculpture, photography, printmaking, drawing, and mixed media. The exhibition features the student’s individual creative accomplishments, as well as highlighting the quality of education and types of courses offered through the art studio program at SSU. The jurors for this year’s competition were Chelsea Pegram, who is a recent MFA graduate from Mills College, and Eli Ridgway, owner of the Eli Ridgway Gallery in San Francisco. The jurors not only select work for the exhibition but come to the campus to meet and talk with art students about careers and trends in art. The exhibition continues through April 14. For more information check their website sonoma.edu/artgallery. The Hamilton Air Field, in Novato, is the location of two new art exhibitions that I highly recommend. First, at the Marin Museum of Contemporary Art, the new exhibition that just opened is called AB/NORMAL: 3 Bay Area Emerging Artists. The exhibition features the work of Dan Herrera, Aron Meynell, and Paula Moran. Though they work in different media, each of the artists uses a narrative approach to question normal reality by using disorienting combinations of images and materials. While all three of these artists have recently graduated from Bay Area MFA programs, they display proficiency of skill, and mastery of their visual story-telling process. Dan Herrera uses a combination of nineteenth-century photographic techniques, and digital technology. In his series called Vaudeville, he creates tableaus of quirky side-show characters, along with wild surrealistic imagery. Aron Meynell fills his paintings and charcoal drawings with isolated figures set in post-apocalyptic surroundings. The influence of his time spent living in Detroit is reflected in the eerie abandoned buildings and snow-filled winter landscapes. Paula Moran creates wheel-thrown and hand-built ceramic pieces that re-create common, everyday objects. The pieces are finished with detailed realism that defies their original materials and substance. In painting, this technique is called trompe l’oeil, which is a French term that means to ‘fool the eye’. Moran arranges the objects in vignettes that make reference to social issues and cultural situations. The exhibition continues through April 14. The Marin Museum of Contemporary Art is located at 500 Palm Drive, Hamilton Field, in Novato. For more information check their website marinmoca.org. Then, at the Marin Community Foundation, the current exhibition is called Millennial Abstractions. For this show the curator, Patricia Watts selected nearly 100 artworks by 22 California artists. Primarily through large-scale paintings, the artists have responded to issues of the new millennium, such as politics, climate change, and social disruptions. The work demonstrates how artists can use methods of abstraction to express feelings, insights, and perspectives. By using color, form, line, and texture the artists place points of reference, which can evoke emotions and ideas, and even promote transformation. The process invites contemplation and allows the viewers to form their own personal interpretations. In a sense, this provides for a deeper conversation between artist, artwork, and the viewer. A reception will be held on Thursday, March 14 from 4:30 to 6:30 p.m. The exhibition continues through May 31, and is on display in the offices of the Marin Community Foundation, which is located at number 5 Hamilton Landing, Hamilton Field, in Novato. For more information check their website, marincf.org. Aside from things like content and composition, there are many elements, both tangible and intangible, that go into the making of art. Of the tangible ones, Tools and Materials are the focus of two new local exhibitions that address each of these topics. First, at the Seager Gray Gallery, in Mill Valley, the current exhibition is called Materials Matter. The emphasis here is on materials and how artists use them to communicate their ideas. Whether it’s glass, wood, fabric, clay, metal, or paper, the chosen material can play an essential role in communicating the meaning of the piece. Through the work of 15 regional artists, the exhibition demonstrates how the integrity and coherence of an artwork are enhanced when form and content are in perfect accord—and that materials really do matter. A specialty of the Seager Gray gallery is the art of the book, and that genre is strongly represented in this show. Artists such as Jody Alexander, and Andrew Hayes, each create new stories from existing books, by rebinding the pages, and restructuring the forms with materials like cloth, steel wool, or metal. There are many other art forms on view as well, including wood and found-object pieces by Joe Brubaker; stitchery and fiber art by Lisa Kokin; and ceramic sculptures by Richard Shaw. A Reception for the artists will be on Friday, March 8, from 6 to 8 p.m. The exhibition continues through March 31. For more information check their website, seagergray.com. Then, at the Sonoma County Museum, in Santa Rosa, is Tools as Art: Selections from The Hechinger Collection. The exhibition features 47 contemporary artworks based on familiar, everyday tool forms, for example, hammers, saws and wrenches. The collection was started in the 1970s by the owners of the Hechinger hardware store. Originally, the tool-related art was displayed in the company’s headquarters, on the East Coast. In the exhibition here, the humorous as well as thought-provoking pieces reflect a wide range of styles and media. Among the works in the show you will see pieces by internationally recognized artists such as Claes Oldenburg, and Jim Dine, as well as national and regional artists. Through humor and irony the artworks invite you to take a deeper look at tools. The purpose of the exhibition is to educate and inspire people of all ages about tools. More importantly, it is to honor the dignity and beauty of everyday tools, where form and function are linked and celebrated. The exhibition opens with a reception on Friday, March 8, from 6 to 8 p.m. and will include a performance of ‘tooled’ music by the witty and brilliant assemblage artist, Monty Monty. The exhibition will be on view through June 2. A number of interesting related events will take place during that time. For more information check their website, sonomacountymuseum.org. The new juried exhibition at Sebastopol Center for the Arts is called Playground, and features artwork that explores childhood memories and concepts of play, including places, people, toys, games and activities. The Jurors, Michael McGinnis, and John Watrous selected over 60 works by 50 regional and national artists. The two jurors were particularly well suited to the task of selecting playful artwork. Watrous is a retired college art professor whose interest in ham radios is reflected in his gadget-like constructed sculptures. McGinnis, who teaches sculpture at Santa Rosa Junior College, recently won the “Game of the Year” award from the Toy Industry Association in New York. The award was for his invention called, Perplexus, which is a three-dimensional, labyrinth-type puzzle. The theme of the Playground exhibition is expressed in a variety of media, including painting, photography, sculpture, and mechanical wonders. Also on view, in Gallery II at the Art Center, is Gardens and Figures, showcasing paintings by Diana Toso, and ceramic sculptures by Jonnie Russell. Toso’s oil paintings of garden scenes and potted plants are paired with Russell’s mythical creatures that often combine human figures with animal heads. Russell works in clay from live human models to create the mixed species figures that depict human postures, relationships and attitudes. Both exhibitions open with a reception on Thursday, February 28, from 6 to 7:30 p.m. and continue through March 30. The opening reception will include a live art performance by Terry Coleman called “Bag Dance Sketch“, I’m sure that’s something not to be missed. Sebastopol Center for the Arts is located in the Veterans Building on High Street. For more information check their website, sebarts.org. Then the Barracks Studios, in Santa Rosa, is hosting its First Saturday, OPEN STUDIOS on March 2, from 1 to 4 p.m. Eight of the resident artists invite you into their studios to view their latest creations, and chat with them about their process and inspirations. You can see work by Carol McFarlan, Mardi Storm, Paula Cliff, and others. You can watch demonstrations, enjoy refreshments, and hear live music by Outlaw Dervish. The one-day event is Saturday, March 2, from 1 to 4 p.m. The Barracks Studios are located on Finley Ave, off of Hwy 12 and Wright Road, in Santa Rosa. Here is an array of interesting things to see in galleries and museums around town. First, at Local Color Gallery, in Bodega Bay, Rik Olson has a small but very nice exhibition in the front gallery space. Perhaps known best as an accomplished printmaker, Olson is also a talented painter. The coastal views and nautical scenes on display here are painted with bright fresh colors and lively brushstrokes. The show includes both prints as well as paintings, and when you look at them side by side you can see the differences and similarities in how Olson develops his images using either media. The exhibition continues through March 11. Local Color Gallery is located on Eastshore Road in Bodega Bay. For more information check their website, localcolorgallery.com. Then the Hammerfriar Gallery in Healdsburg, is celebrating their 8-Year Anniversary with a group show. In the main gallery space downstairs you’ll find a number of works by Mike Tinney. In these mixed-media paintings Tinney applies oil to paper and copper with vigorous linear markings that almost look like etchings. In one of the rooms upstairs is an installation by Christiane Vincent, called Fragile Light. On the back wall, which is painted black, the artist arranged clumps of shattered glass that appear as shimmering space objects in a night sky. The exhibition also includes work by some of the gallery’s regular artists such as Art Moura, Frank Miller, Chris Beards, Michael Garlington, Cathy Richardson and others. The exhibition will be on view through March 30. Hammerfriar Gallery is located at 132 Mill Street, in Healdsburg. For more information check their website, hammerfriar.com. Finally, at the Charles M. Schulz Museum, in Santa Rosa, the new exhibition in their Upstairs Gallery is called Art of the Line. This exhibition focuses on the process used by Charles Schulz to produce an aesthetically pleasing and well-designed drawing. Along with the message of a Peanuts comic strip, the over-all visual design was also very important to Schulz. In trying to explain his process Schulz stated that, “it’s as difficult as explaining what a poem is about”. This exhibition of original comic strips, photographs, and research material offers the opportunity to learn more about Schulz’s methods including the tools he used, and the research he did to complete each masterpiece. This exhibition will be on view through September 1. The Charles M. Schulz Museum and Research Center includes numerous permanent exhibits in and around its attractive building, which is located near Snoopy’s Ice Arena in Santa Rosa. For more information check their website, schulzmuseum.org. Here are some worthwhile things to see in the visual arts around Sonoma, Napa, and Marin counties. Beginning in Santa Rosa, at the Gallery of Sea and Heaven, the new exhibition opening this weekend is called ALKONOST, an exhibit of Legend and Lore. The exhibition features the work of nearly 30 artists who participate in the Becoming Independent art program. Like many of the exhibitions here, the show also includes work by artists from the broader community. The Alkonost, according to Eastern European folklore, is a marvelous creature with the body of a bird and the head of a beautiful woman. During the opening reception, which is on Saturday, February 16, from 5 to 7 p.m., there will be a reading of a folktale by one of the artists. The exhibition continues through April 6. The Gallery of Sea and Heaven is located at 312 South A Street, in Santa Rosa. For more information call 707-578-9123. Then, the new exhibition at di Rosa, in Napa, is MFA Selections: A Salute to Bay Area Emerging Artists. This is a biennial exhibition that showcases the work of artists who recently completed their Master of Fine Art degrees. The artists in the exhibition were selected by a group of jurors from a pool of students nominated by faculty from Bay Area colleges and universities. The six featured artists are Llewelynn Fletcher from California College of the Arts, Jacqueline Gordon from Stanford University, Angie Wilson from San Francisco State, Chris Fraser, Camilla Newhagen, and Chelsea Pegram from Mills College. The exhibition includes sculptures and installations that use light, sound, textiles and other unusual materials. Some of the artists created new or site-specific works for the exhibition that respond to the di Rosa property and exhibition space. The exhibition will be on view through March 31. For more information check their website, dirosaart.org. Finally, Gallery Route One, in Point Reyes Station, offers three new exhibitions. In the Center Gallery is Diana Marto, Ineffable-Canto XXIV. Marto’s abstract paintings on paper are inspired by text and calligraphy. In the Annex Gallery is Igor Sazevich: A Glance Back to the 70s, which includes oils and watercolors. Then, in the Project Space there is a powerful and provocative exhibition called, An Inventory of al-Mutanabbi Street. This is a selection of artist Books and letterpress Broadsides from a project by the Al-Mutanabbi Street Coalition that is being exhibited around the world. The artworks were made in response to the car bombing on Al Muta-nabbi Street, a street of booksellers in Baghdad, in March of 2007. And, according to the coalition website, the purpose is to make artwork that holds both “memory and future”, exactly what was lost that day. All three exhibitions continue through March 17. Gallery Route One is located on Highway One, in Point Reyes Station. There will also be a Poetry Reading related to the book project, on Sunday, February 24, from 2 until 4 p.m. at Eubank Studio, which is in the same building complex as GRO. The Eubank Studio houses the Sometimes Books Gallery with a current exhibition called The Infinite Book. For more information about all these events check the website, galleryrouteone.org. Having universities and colleges in our community adds a lot to our cultural enrichment in art, music and theater. Here are a two you may want to check out. The new exhibition at the Santa Rosa Junior College art gallery is called The Still Point. The exhibition includes the work of three artists, Emily Lazarre, Connie Goldman and Judith Foosaner. Each artist works in a non objective, abstract style, conveyed through combinations of painting, drawing, and collage on paper and panels. Though there is no obvious imagery in the work, the artists express emotion and meaning through line, shape, color, space, and value. Both Lazarre’s and Goldman’s work embodies a minimalist aesthetic. The solid areas of color and layered geometric shapes are not bound by rectangular formats and evoke a dynamic energy and physicality. On the other hand, Foosaner’s black and white paintings and collages use organic shapes and calligraphic marks to express rhythm and movement. According to the curator, Suzanne Lacke, what unifies this body of work is that “each of them seems to come to a point in their work where there is crystallization, a synthesis, a ‘still point’”. This still point belies the process of investigation and experimentation that is beneath the surface of the finished work. The Opening Reception is on Thursday, February 7, from 4 to 6 p.m. and the exhibition continues through March 7. There will also be a Panel Discussion with the artists on Monday, March 4 at 12 noon in the gallery, which is located in the Doyle library of the Santa Rosa J.C. campus. For more information check their website, santarosa.edu/art-gallery. Then at Sonoma State University the current exhibition in the University Art Gallery is called New York Paper, and features the work of two artists, Brian Novatny and Jennifer Nuss. What ties the show together is that both artists are from New York and the work is on paper. After seeing the exhibition the one word that kept coming to my mind was “quirky”. Let me explain. In the gallery space with Novatny’s work there are pages from his sketch books pinned to the walls. Most of the finely detailed sketches are of people that, even though unfinished, are extremely expressive and appear as portraiture. The incomplete narratives are a bit disconcerting and prompt intrigue by what is depicted as much as by what is left out. I think of Leonardo da Vinci and his meticulous sketches of street people. On the other side of the gallery is the work of Jennifer Nuss. These are not small. Nuss develops large, thick sturdy surfaces of layered Japanese paper that look like vellum or animal hide. She then uses gouache and other media to create a visual narrative that runs throughout the series. Each of the large format works illustrates the myth of the goat girl, who prances and floats about through various adventures. She’s not pretty, yet in all her pink hairiness, she is charming. Nuss shows a tender touch in the carefully articulated toe nails and delicately painted wreaths of plants and flowers in the girl’s braided hair. The exhibition will be on view through February 24. For more information call (707) 664-2295. The new exhibition at the Seager Grey Gallery, in Mill Valley, is Helen Stanley: Arbors of Imagination. Helen Stanley paints scenes and close-ups of nature in astonishing detail. As an avid hiker and nature lover, Stanley carefully observes the textures, contrasts, and features she sees around her. With this sharp awareness she creates work that is both accurate as well as stylized. While Helen employs a variety of paint media, she occasionally uses walnut ink, which gives her work an even greater authenticity. A reception for the artist is on Friday, February 1, from 6 to 8 p.m. The exhibition runs through March 3. For more information check their website, seagergray.com. Then at the Risk Press Gallery, in Sebastopol is Abstraction, paintings by Carol Herzog and David Kingwill. Both artists use line, shape, color and texture to produce abstract paintings—yet their methods and styles are quite different. Kingwill’s brilliant and luminescent colors flow freely over a bright white background. His method entails pouring acrylic paint onto unstretched canvas, and guiding it to form overlapping fields of color. The process is dynamic and not always predictable. For Kingwill, who is an architect, the technique is a nice contrast to his technical drawings. As a counterpoise to Kingwill’s fluid, free-form style, Carol Herzog’s mixed media paintings demonstrate a much more developed structure. She uses linear elements and a muted palette of colors to generate tension and compression of forms. Herzog is also co-Founder of the Abstract Artists Group of Sonoma County, which was formed in the late 1990s. The exhibition opens with a reception on Saturday, February 2, from 1 to 6 p.m., and continues through February 24. For more information, check their website, riskpress.com. Finally, in Santa Rosa, the Sixth Annual Small Works Exhibit takes place in the SOFA Arts District, which is located on and around South A Street. For one day only all the galleries and studios in the district are showing small works, at small prices, by over 37 artists. Just some of the places you’ll be able to visit are the Gallery of Sea & Heaven, Gallery 300, and Uribe Studios Backstreet Gallery. There are also some excellent new eateries in the area you’ll want to try. The event takes place on Saturday, February 2, from 5 to 8 p.m. For a map of the district and list of galleries, check their website, sofasantarosa.com. On a slightly different note, I want to mention an opportunity for artists. The Creative Work Fund is providing grants to artists and non-profit organizations that collaborate on projects together. Vicky Kumpfer, who is with the Arts Council of Sonoma County, is hosting an informational meeting where you can find and create partnerships for collaboration. The meeting will take place on Wednesday, February 6, from 6 to 8 pm at The Imaginists Theater, which is located at 461 Sebastopol Avenue, in Santa Rosa. For more information about the meeting, call Vicky at 707-477-0567. You should also check out the creativeworkfund.org website. Art exhibitions have the ability to help us explore and experience unexpected or out-of-the-ordinary places. Here are three, each with a different approach to unfamiliar territory. The upcoming exhibition at the Sonoma County Museum, in Santa Rosa, is called, In My Back Yard; the Sonoma County Museum as Subject. While this might not sound too unusual, the exhibition offers views and details of the museum you may not have seen before. The exhibition curators, Pat Lenz and Dominic Egan, invited photographers and artists to photograph the museum, allowing them access to the galleries, as well as spaces not usually seen by the public, such as the attic, vaults, workrooms, the basement. The photographers, both professional and amateur, used a wide range of equipment from sophisticated to simple, to capture their unique perspectives of the Museum. The exhibition opens with a reception on Friday, January 25, from 5 to 8 p.m. and continues through February 23. For more information and a list of related events, check their website, sonomacountymuseum.org. Then, at Headlands Center for the Arts, where you can always expect something unusual, the current exhibition is called Translocura, Art at the Brink of Madness. The show includes the work of ten artists, plus a video installation by Postcommodity, the Indigenous arts collective. The exhibition offers varied perspectives on the uncertainty of everyday experiences. From the expected to the unforeseen, unsettling transitions offer a peek into the potential madness that lies just beyond the normalcy and routine of everyday life. The show was curated by John Jota Leaños, who is a social art practitioner and Assistant Professor of Social Practices at the California College of the Arts. The exhibition continues through February 24. Headlands Center for the Arts is located at the historic Fort Barry, in the Marin headlands. For more information and directions check their website, headlands.org. Finally at the Sonoma Valley Museum of Art, in Sonoma, the new exhibition is called Revolutionary Island: Tales of Cuban History and Culture, The Sarah & Darius Anderson Collection. This compelling and informative exhibition features a small portion of the art and artifacts gathered by two passionate collectors during more than twenty-five years of travel to the island. The work includes a diverse array objects in a variety of media. The paintings, prints, posters, sculptures, and videos tell a story of Cuba’s culture and history from about 1911 to the present. Most of the artwork in the exhibition is by Cuban artists, but one piece, a replica of the tank driven by Fidel Castro and Ché Guevara, was built by Sonoma County artist, David Best, who is known for his art cars and involvement with Burning Man. The focus of much of the work on display expresses social and political commentary, and some of it is quite moving. There are also objects that speak of Cuba’s cultural pastimes and interests, such as baseball, cigars, and rum. While other pieces on view are examples of recent work, providing insight into contemporary Cuban art. The exhibition continues through March 24. For additional information and related events, check their website, svma.org. We are fortunate to have the opportunity to see a number of new and continuing art events in the area right now. I’ll mention just a few. For starters, the current exhibition at Gallery Route One, in Point Reyes Station, is called Out of the Blue. This juried show takes on the theme of blue-ishness, which is represented through colors, moods, and references to music. The juror, Ruth Braunstein, selected work from over 40 regional artists, including Simmon Factor, Virginia Fauvre, Linda MacDonald, and Zea Morvitz. The exhibition will be on view through February 3. Gallery Route One is located on Highway One, in Point Reyes Station. For more information check their website, galleryrouteone.org. Next, Sebastopol Center for the Arts is opening two new exhibitions. The first is a juried exhibition called Reflections. The Juror, Mary Mountcastle Eubank, selected nearly 60 artworks in a variety of media that examine the theme of Reflections through numerous interpretations such as visual, psychological, and metaphorical. Also at Sebastopol Center for the Arts, is a show of Stone Sculpture featuring work by Karen Ryer, along with her students and guest artists. Karen Ryer is a wonderful, high-energy person who has been teaching stone-carving for over ten years. Her ability to teach, inspire and encourage is evident in the work of her students, many of whom are showing for the first time here. Also on view is work by her mentor, Jerrold Ballaine. Both exhibitions open with a reception on Thursday, January 17, from 6 to 7:30 p.m. and will continue through February 23. Sebastopol Center for the Arts is now located at the Veterans Memorial building on High Street, next to Ives Park. For more information check their website, sebarts.org. Then, I want to mention, Art from the Heart, the annual auction benefitting the University Art Gallery, at Sonoma State. This is always a fun and well-attended event with fabulous affordable art by over a hundred top-notch artists. Many pieces are made specifically for this event, with artists working on them months in advance. The auction is Saturday, January 19 from 6 to 9 p.m. Tickets can be purchased at the door. It’s about Good art, for a good cause. For more information call 707-664-2295. Finally, the Graton Gallery, in downtown Graton is hosting their Seventh Annual Invitational Exhibition. Thirty-four Northern California painters, printmakers, and sculptors have been invited to participate in this year’s exhibition, including Chester Arnold, Art Hazelwood, Camille Przewodek, Judson Smith, and Shane Weare. Organized and curated by Rik Olson, the Invitational brings together the work of many distinguished artists in one place. You can meet the artists at a reception on Sunday, January 20, from 2 to 5 p.m. For more information and a list of all the artists, check their website, gratongallery.com. The Finley Community Center, in Santa Rosa, has just opened two new exhibitions. The first is Monty Monty’s Traveling Air Show & Aeronautical Wonders. Monty Monty is a well-known and truly remarkable assemblage artist. His witty sculptures are made from vintage collectibles, found objects, and, in his own words, “discarded items of interest.” He carefully restores these items, and treats each one with respect. These objects and their histories inspire the creation of his amazing structures. With meticulous craftsmanship and attention to detail, he assembles the artwork without soldering or welding. It’s a delight to hear Monty talk about his work as he describes the various components in terms of visual word puns, and how each plays an important role in the sculpture as a whole. The work in this particular exhibition is a tribute to the imagination and ingenuity of the early aviation pioneers and includes a unique array of Fantasy Flying Machines that take to the air with whimsy and wonder. Also on view at the Center are Photographs by Nik Catalina. Nik loves the magic and wonder of Nature and its awesome, ever-changing beauty. The photographs in this series include landscapes, seascapes, and intimate up-close details of the natural world. A reception for the artists will take place on Thursday, January 10, from 5 to 7 p.m. Both exhibitions continue through February 7. The Finley Community Center is located on West College Avenue at the corner of Stony Point Road. For more information call (707) 543-3737. Then, the new exhibition at the Petaluma Art Center is called 4 Weavers: Contemporary Expressions of an Ancient Craft. On view are handcrafted costumes, clothing, and multi-dimensional textiles created by four contemporary artists. Candace Crockett, Ulla de Larios, Suki Russack, and Barbara Shapiro began as weavers, and continued sharing ideas and working together for many years. Though they have followed different paths in developing their art, each has a unique place in the fiber arts movement. The exhibition demonstrates their passion and commitment to labor-intensive textile techniques and developing strong, contemporary visual statements. The exhibition also includes examples of work by Sandra Ericson, who is the director of the Center for Pattern Design in St. Helena. The opening reception is on Saturday, January 12, from 2 to 4 p.m. During the reception dancers will be modeling woven costumes and clothing created by the artists, which should be very interesting. The exhibition continues through March 10. For more information about related events, demonstrations, and classes, check their website, petalumaartscenter.org. Continuing the theme of textiles, the Occidental Center for the Arts is opening an exhibition of Quilted Fiber Arts. The exhibit features a collection of large and small quilts by members of the Pointless Sisters. This is a subgroup of the Santa Rosa Quilt Guild. What brings this group together is their affinity for using unusual materials and techniques to create their distinctive quilted artworks. A reception for the artists will be on January 13 from 1 to 3 p.m. The exhibition continues through March 3. For more information check their website, occidentalcenterforthearts.org. First of all, I want to wish each of you a fabulous and art-filled New Year. I’m looking forward to a robust new season of art exhibitions in Sonoma County and beyond. Here is a couple to get started with. The new exhibition at Risk Press Gallery in Sebastopol is Scenic Journey: Sonoma County and Beyond, paintings by Terry Sauvé. Terry begins her landscapes by painting en plein air, which is a French expression that means “painting out-of-doors”. Typically when an artist works in this way they must be quick and keen observers to capture the scene directly before them, as the light and other conditions can change rapidly. While Terry paints what she sees, she does not simply record the view. By also being attuned to the sounds, smells, and mood of the moment, she interprets the essence of the location with greater depth and insight. For example she may intensify a color, or adjust the composition of shapes and patterns to direct the viewer’s eye. Her soft-hued oil paintings are classic in their composition but contemporary in their uncluttered imagery. The exhibition continues through January 29. For more information check the gallery’s website, riskpress.com, or go to the artist’s website, terrysauve.com. Then at the Seager Gray Gallery in Mill Valley, the current exhibition is Inez Storer: Made up Stories from an Imagined Past. Inez is an accomplished and fascinating artist who lives near Point Reyes Station in West Marin. Her mixed-media work makes use of new digital technologies along with traditional methods of painting, drawing, and collage. Using a story-board flatness of space, she combines illustrative renderings with bits of text. In this way she narrates her personal stories, blending them with popular imagery as well as imagined and real histories. The artwork suggests various aspects of her life, including objects in her surroundings, a mixed cultural background that had been kept hidden from her, and her connections to Russia. The work occasionally makes art historical references to the likes of Matisse, Velasquez, and Rauschenberg. Each of the medium to large-scale panels is like a page from a travel journal or postcard, layered with notes, stamps, and other markings collected during its journey through time. In general the collection of work reflects a life long-lived, well-travelled, and mulled over with wry amusement. A reception for the artist will take place on Friday, January 11 from 6 to 8 p.m. The exhibition will be on view through January 31. For more information check their website, seagergray.com. The winter holiday season is very much here and it’s a time when many venues in the area are hosting member shows. Here are some good ones not to be missed. First, the Sebastopol Center for the Arts has their Annual Members Show on view through January 5, and this is in their brand new location at 282 High Street, which is a must-see in itself. Then Petaluma Art Center, on Lakeville Hwy., has their 12th Annual Members Exhibition on view through December 23. On a similar note, Art Works Downtown, in San Rafael, is featuring a Holiday exhibition called, Art on the Farm. The exhibition is a fundraiser for the Marin Organic’s Farm Field Studies Program. This Program connects K through 12 Bay Area students to organic farms, food production, and the natural world. And The Art on the Farm organization is a community- based partnership between artists and Marin Organic farmers. This collaborative exhibition celebrates art and local farms in a fun and educational manner. It’s a wonderful example of how art can be integrated into the community and play a vital role in connecting and engaging various segments of the population. The exhibition features the work of over 65 artists, and is displayed throughout their entire building. A second reception for the show will take place on January 11 from 5 to 8 p.m. The exhibition continues through January 17. ArtWorks is located at 1337 Fourth Street, in San Rafael. For more information check their website, artworksdowntown.org. What makes this body of work distinctive is that this ethereal subject matter is presented on unusual materials such as silk, linen, aluminum, wood and clay. These denser materials are in contrast to the meditative quality of her work, but also provide a sense of grounding. The exhibition continues through January 12. Marin moca is located on Palm Drive, at Hamilton Field in Novato. For more information check their website, marinmoca.org. After more than ten years, Sebastopol Center for the Arts has moved from their Depot Street location into the newly remodeled Sebastopol Veterans Building. This was no small feat. With many months of negotiating, planning, and fundraising, the Vet’s Building has been transformed to better serve the needs of a dynamic and expanding art center. You’ll be amazed to see what’s been done with the space. It was nice to see that they were able to create an elegant and spacious art center while retaining important architectural and design elements of the historic mid-century building. Besides a flexible gallery space with cutting-edge lighting, the new center can now expand and better support their programs in education, performance, and film. The first exhibition on view in the new gallery is the Annual Members Show, which is very appropriate considering the importance and contributions of a strong membership base. With well over 300 pieces in the show, there should be much to be inspired by. The show will be on view through January 5. The Grand Opening Celebration is Friday, December 7, from 6 to 9 p.m. Tickets can be purchased at the door for $25 and include the opening of the exhibition, live and silent auctions, live music and refreshments. The new location is at 282 South High St., near Ives Park. For more information check their website, sebarts.org. Speaking of Members Shows, it seems to be the season for them, and it’s a nice way to buy art produced by local artists for holiday gift giving. There are a couple of other Members Shows in the area I want to mention. First, the Petaluma Art Center has their 12th Annual Members Exhibition on view right now and will be on display through December 23. For more information about the show and all their programs check their website, petalumaartscouncil.org. Then the Arts Guild of Sonoma is also featuring artwork by the guild members along with their December Invitational. The Guild is located at 140 East Napa St. in Sonoma, and the show will be on view through December 31. For more information check their website, artsguildofsonoma.org. Finally, while not officially a member’s show, the Retrospect Gallery in Sebastopol is having a Holiday Art Show by some of the “usual suspects”. Affordable artwork by Todd Barricklow, Art Moura, Gregory Odle and Judson King Smith will be on view, and for sale, through the end of December. A reception for the artists will be on Friday, December 7, from 5 to 8 p.m. The gallery is located at 104 Petaluma Ave., in Sebastopol. For more information you can call Gregory, the owner, at (707) 291-7058. Landscapes have been one of the most popular subjects in art throughout time, and this is certainly true, even today. While there are a number of venues in the area that show quality landscape art, here are a couple special exhibitions you can visit this week. Peace at Sunset, by Thomas Cole. First, currently on view at the Sonoma County Museum, in Santa Rosa, is a historical perspective of landscape painting with three related exhibitions. The theme is developed around the work of Thomas Cole, who was a painter of American landscapes during the nineteenth century. The suite of exhibitions begins with a showing of a single painting by Thomas Cole, which is dramatically presented in the small side gallery. The painting, Peace at Sunset (Evening in the White Mountains), is on loan from the De Young Museum. I found that taking time to closely view just one painting by the artist gave me the opportunity to study its structure and composition, as well as appreciate the mood it evoked. The theme unfolds in the Main Gallery with an educational exhibit called Wild Land: Thomas Cole and the Birth of American Landscape Painting. Thomas Cole is considered the father of landscape painting in the United States, as well as the founder of what became known as the Hudson River School. The interactive displays develop the story of Thomas Cole, his place in art history, and the evolution of American landscape painting. As a visionary and environmentalist, Cole painted idealized landscapes based on the numerous sketches he did while hiking in the Northeastern wilderness. His intent was to bring attention to the need for preserving the wildness before it was all gone. The story continues with an exhibition in the upstairs galleries called The California Landscape: Conservation & Collections at the Sonoma County Museum. The twenty-five or so paintings from the Museum’s permanent collection showcase a variety of California landscapes from the nineteenth and early-twentieth century. Included are works by artists such as Thomas Hill, William Keith, and Ransom Gillet Holdredge. The exhibitions will be on view through January 13. For more information, check their website, sonomacountymuseum.org. For contemporary artists, the tradition and practice of landscape art continue on — as strong as ever. There are many excellent landscape artists in the area today. As an example I want to mention Sterling Hoffmann, who is a consummate and dedicated painter of local scenics. He is often motivated to paint for the same reasons as Thomas Cole, which is to celebrate the beauty of nature, as well as to protect it. Hoffmann is currently showing a selection of his paintings at the Dutton-Goldfield Winery. A reception for the artist will take place at the winery on Saturday, December 1 from 1 to 3 p.m. The exhibition continues through January 14. The Dutton-Goldfield Winery is located at the corner of Highway 116 and Graton Road, in Sebastopol. For more information check their website, duttongoldfield.com. You can also see Hoffmann’s work on his website, sterlinghoffmann.com. This weekend at The Quicksilver Mine Co. in downtown Forestville is the opening reception for a very special exhibition. The show is called The Last Hurrah. Its noteworthy status is due to the fact that this will be the last and final exhibition at the gallery. After almost thirty celebrated years, owner Khysie Horn has decided to close the gallery, and go on to do other things. The Last Hurrah features the work of nearly 100 artists and craftspeople who have exhibited at Quicksilver since the gallery first opened in its original Guerneville location in 1983. The exhibition is hung salon-style, which means the gallery is filled from floor to ceiling, and includes a wide range of art and fine crafts in a variety of media. Over these past many years, The Quicksilver Mine Co has been one of the best art galleries in Sonoma County, and perhaps north of the Golden Gate Bridge. They have consistently shown high-quality exhibitions that were professionally installed and managed. Khysie has been a dedicated supporter of the arts in general. She has given many artists their first solo shows, and set aside part of the gallery space for on-going sales opportunities. She has exhibited the work of both emerging artists as well as those with established international reputations. This final exhibition represents just a small fraction of the close to 600 artists who have shown and sold their work at Quicksilver during the past thirty years. Quicksilver has done more than just show and sell art. Khysie and her devoted team have also presented gallery talks, literary events, musical concerts, and community gatherings. I salute Khysie and her team for the many years of inspiring shows, and wish them all well in their next adventures. The Last Hurrah opens with a reception on Saturday, November 17, from 4 to 6 p.m., and will be on view through December 31. Go see the show, and express your best wishes to Khysie, Ray, and George. For more information, a history of the gallery, and a list of artists, check their website, quicksilvermineco.com. The closing of Quicksilver will surely leave a big void, but it’s also an opportunity for others to step forward. One place to look for that is in the South A Street Arts District in Santa Rosa, where a vibrant arts scene is blooming. This weekend, the SOFA arts district is celebrating their 8th annual Winterblast Festival on Saturday, November 17 from 5 to 8 p.m. Winterblast is a joyful street party celebrating the arts, and community. People of all ages are invited to enjoy open art galleries and studios, local food vendors, music, dance, street performers, and the one-of-a-kind SOFA Parade. You don’t want to miss this free event. For more information, check their website, sofasantarosa.com. The new exhibition at di Rosa, in Napa is called, Renaissance on Fillmore, 1955 – 65. Around this time young people throughout the country were becoming disillusioned with the American Dream, as well as trying to cope with the threat of the cold war and nuclear annihilation. Creative people of all types began gathering in places like Greenwich Village, in New York, and North Beach, in San Francisco, and collectively they became known as the Beat Generation. Renaissance on Fillmore features the work of 17 artists who either lived or worked in San Francisco’s Fillmore District, which had been an important hub of creative energy. It cultivated a remarkable and eclectic group of painters, poets, and musicians who influenced the course of American art. Generally working outside of academic institutions, these artists gathered in night clubs and coffee houses, listening to music and poetry, and sharing ideas. Instead of well-established galleries and museums they tended to show their work in non-traditional spaces and cooperative galleries such as Six Gallery, and the Batman Gallery. The nearly 30 paintings, drawings, sculptures, and mixed media works in the exhibition are accompanied by historic photographs, posters, and exhibition announcements that document this vibrant period of Bay Area art history. Some of the artists whose works are on view include Paul Beattie, Joan Brown, Bruce Conner, Jay De Feo, Sonia Gechtoff, and Wally Hedrick. This show coincides with other important related exhibitions in the area, including the Jay De Feo Retrospective, which is currently on view at the San Francisco Museum of Modern Art. An Opening Party for the di Rosa show will be on Saturday, November 10, from 6 to 8 p.m. The exhibition continues through January 27. For directions and more information check their website, dirosaart.org. Water is not only in the news, and on our minds these days, but has been a defining element of cultures for thousands of years. Art can serve as a powerful tool to express the imagery, concepts, and attitudes about water. Right now there are two exhibitions in the area that take on the subject of water and its many associations — both the complex, as well as the sublime. A new exhibition opening soon at the Sonoma State University Art Gallery is called Under Water, and features work by local, regional, and national artists that depicts water either literally or metaphorically. The paintings, prints, photographs, and sculptures make use of a variety of materials including actual water itself. Some of the 17 participating artists include; Pegan Brooke, Christo and Jeanne-Claude, Helen and Newton Harrison, Tony King, Larry Sultan, and Catherine Wagner. The exhibition is part of a larger, campus-wide and year-long event called Water Works. This cross-disciplinary project explores inland water-flow as a resource, inspiration, and metaphor. The University has planned a number of exhibitions, films, performances, classes, and other activities through next spring celebrating this theme. The gallery exhibition opens with a reception on Thursday, November 8, from 4 to 6 p.m. and will be on view through December 9. For more information about all the events check the website, sonoma.edu/waterworks. Then in the offices of the Marin Community Foundation, in Novato, the current exhibition is, Works on Water: 30 artists explore the aesthetics and politics of water. This exhibition features recent artwork by artists from around the country, including many local, and regional artists. The artwork represents a wide range of media and explores numerous important political and social issues around water. The topics, which are as ancient as they are current, include water consumption and quality, drought and flooding, uses and water rights, and the effects of rising sea levels on our fresh water supplies. To create a good balance, the exhibition also portrays water as a source of aesthetic inspiration, a life-giving and healing medium, and a symbol of survival for us on this watery planet. The exhibition is on view right now at the Marin Community Foundation offices, located at #5 Hamilton Landing, in Novato. A reception for the artists will be held on Wednesday, November 14, from 4:30 to 6:30 p.m. The exhibition will continue through February 5. For more information check their website, marincf.org. There are three exhibitions I want to mention in Marin County. Closing soon at the Seager-Gray Gallery in Mill Valley, is an exhibition called, Raveling, featuring the work of Lisa Kokin. The subject of this body of work was inspired by the artist’s relationship with her mother, who passed away not long ago, at the age of 99. Kokin’s method and medium are quite unique and defy easy categorizing. In a labor intensive process Kokin draws her images with thread, and incorporates handwritten text, bits of wire and paper shreds from book pages. The title word ‘raveling’ refers to a thread that has become separated from a woven material. For Kokin, the thread is not only used to articulate her images, but is also symbolic of continuity and separation. Many of the pieces reference an old photograph of mother and daughter. Others incorporate the phrase, “take me home now”, which were some of Mom’s last words. The repetition of these images and phrases is an effective device that ties the work together. Like much of Kokin’s other work, these delicate and lacy pieces reflect her background and interest in stitching and fibers, and are imbued with wit, irony, layers of meaning, and depth of content. A closing party where you can meet the artist will take place on Friday, October 26, 5 to 7 p.m. The exhibition continues through October 31. For more information check their website, seagergray.com. Then the Marin Museum of Contemporary Art, in Novato, presents Legends of the Bay Area: honoring San Francisco artist, David Maxim. The exhibition features Maxim’s paintings and sculptures that include or imply the human figure. His large scale abstract paintings are often enhanced with 3-dimensional components that engage the viewer like actors on a stage. Other paintings portray the dynamic gestures of the human body simply by using marks and shapes, such as a combination of rectangles and spheres that suggest a reclining figure. Maxim’s anonymous figures also imply metaphorical or philosophical notions of the human condition, and pose situations that represent common human struggles. On occasion his work makes subtle reference to art history, but always retains a sense of the mysterious. The exhibition continues through November 18. Marin MOCA is located on Palm Drive, at Hamilton Field in Novato. For more information check their website marinmoca.org. Finally at Headlands Center for the Arts, which is located at Fort Barry on the Marin Headlands, is an exhibition called Pods, Contraptions, & Relics. As part of their 30th Anniversary festival, the exhibition features work by eleven artists who are alumni of the Headlands’ Artist-in-Residence program. Created as an interactive sculpture and multi-media playground, the artwork invites you to follow an obstacle course, step inside a tiny pod-like structure, and participate in cooperative labor to power a machine. The exhibition closes on Sunday, November 4 with a closing reception from 12 to 5 p.m. Headlands Center for the Arts is located in the historic Fort Barry buildings that served as an active military center until 1950. For more information check their website, headlands.org. There are two new inspiring exhibitions at the Sonoma Valley Museum. In the front part of the gallery space is Larry Thomas: Coastal Echoes. This exhibition of recent paintings, prints, drawings, and calligraphy comes from a body of work inspired by the Northern California coast. Thomas’ abstract imagery captures the changing moods of the coastal landscape, where water and land interact in a ceaseless shifting of patterns and rhythms. The exhibition consists of five different series reflecting on this coastal theme. One is a group called Grass Mountain Drawings. The 14 drawings are displayed on a long low shelf along the wall. The ink and pencil drawings use calligraphic lines to describe what could be leaves and grasses, and perhaps skulls and feathers. The curving linear elements are softened and held together with an atmospheric wash of acrylic paint. Larry Thomas was a professor of printmaking for many years at the San Francisco Art Institute before retiring to the Fort Bragg area where he currently lives and works. Toward the back of the museum is a well-matched companion exhibition called The Art of Handmade Paper. This informative exhibition explores the connections between past and current papermaking traditions and practices of both eastern and western cultures. The curator, Simon Blattner, who is a noted scholar and collector of handmade paper, included historic Japanese papers and paper-making equipment. One rare piece is a 21-foot antique Japanese scroll that illustrates the stages of the traditional papermaking process, from the gathering of mulberry bark through the completion of the final product. This fine piece shares company with some excellent examples by contemporary U.S. artists. This recent work both honors the traditions, as well as pushes the boundaries of the medium by incorporating new materials and techniques. Both exhibitions continue through December 30. For more information check their website, svma.org. Then the Petaluma Art Center is celebrating the Day of the Dead, Dia de los Muertos, with a number of exhibits and events. In the main gallery is an exhibition called Alas de Vida – Wings of Life. The exhibition features selections from the private collection of New World Prints, and represents a sampling of the works by José Guadalupe Posada and Manuel Manilla. The works are accompanied by prints created by contemporary artists, showing how Posada’s and Manilla’s styles and imagery continue to influence artists today. The Curator, Jim Nikas, will give a talk on Friday, October 19, at 6:30 p.m. and will discuss the art and imagery of social movements in Mexico as related to the work of Posada. The exhibition will be on view through November 4. In addition to the exhibition, the Petaluma Arts Center is hosting community altars, other exhibits, and numerous events and workshops to celebrate El Dia de los Muertos. For an impressive list of events and activities, check their website, petalumaartscenter.org. This Saturday and Sunday, October 13th and 14th, begins the first of two weekends for ARTrails, Open Studios, in Sonoma County. With over 150 artists to visit, there’s no time to waste. Okay, so you won’t be able to visit all the studios in person, but you can go to one of the preview exhibitions and make a game plan. There are four locations for preview exhibitions, with the main one, showing the work of all the ARTrails artists, at Wells Fargo Center for the Arts. What I often do is to take note of the studios I most want to visit, and then look at the map in the ARTrails catalog to see what other interesting artwork I might discover in the same area. I also plan in a nice place to have lunch along the way. If you don’t have a catalog, you can go to their website, artrails.org. The website has loads of information, video interviews of artists, and maps. Again, that’s this weekend, Saturday and Sunday, October 13 and 14. The studios will be open from 10 a.m. to 5 p.m. I also want to mention some gallery happenings this week. There is a new gallery in Sebastopol that is well worth visiting. It’s called the Retrospect Gallery, and is currently showing paintings, prints, and sculpture by four artists, Todd Barricklow, Art Moura, Judson King Smith, and Greg Odle. The work of these four artists shares a certain primitive appeal, and inquisitiveness about the inner workings of things, whether involving mythology, psychology or the human digestive system. The gallery is located at 104 Petaluma Ave. in Sebastopol, and is just around the corner from Screaming Mimi’s ice cream parlor. The exhibition continues through November 11. For more information call 707-291-7058. While you’re in downtown Sebastopol, you can walk through the Plaza to Main Street, where the Wine Emporium is featuring the mixed media paintings of Suzanne Edminster. The artist draws her inspiration from wide open rural spaces as well as literature and archeology. The work can be described as intuitive, abstract, narratives. Edminster calls the collection Dionysia, and states that “Dionysus is not only the god of wine and parties, but of organic form and growth,” which seems like a fitting theme for a wine bar. The work will be up through the end of the year. For more information check their website, The-Wine-Emporium.com. Then in Healdsburg, the Hammerfriar Gallery, on Mill Street, is opening a new exhibition called Forward, which features the work of 13 Contemporary artists, including Chris Beards, Seymour Bergman, Sandy Deeks, Michael Garlington, Joe Hawley, Pamela Holmes, Laura Kimpton, Meg Knox, Frank Miller, Art Moura, Cathy Richardson, Bill Shelley, and Mike Tinney. The opening reception is on Saturday, October 13, 6 to 9 p.m. The exhibition runs through December 24. For more information and a list of the artists check their website, Hammerfriar.com. With such abundance in the visual arts, just in Sonoma County alone, it’s hard to mention only a few. The new exhibition at Quicksilver Mine Co., in Forestville, is called Lyrical Complexities, the Sculpture of Charles Fahlen. The show includes nine wall mounted sculptures and six works on paper, created within the past ten years. Charles Fahlen, who passed away in 2010, was born and raised in San Francisco. Then after receiving his master’s in fine arts from the Otis Art Institute, he spent most of his career on the East Coast, teaching at Moore College of Art and Design in Philadelphia. After retiring he moved back to California, to Guerneville, where he continued to create artwork. The constructed abstract sculptures in this exhibition have an architectural feel, and are made of materials that can be found in a hardware store, or as Fahlen once stated; the “Materials are those readily available and anonymous, easily worked and minimally modified.” The linear 3-dimentional sculptures were inspired by, and make reference to, the American West. In the more recent ones, which were inspired by the night skies of Sonoma County, the crimped cables and wires are set off with luminescent cast epoxy orbs, that interplay with the negative spaces and shadows on the wall. The exhibition continues through November 11. For more information check their website, quicksilvermineco.com. Then, to help us get into the mood of politics and elections, the Sonoma County Museum, in Santa Rosa, presents Enrique Chagoya: Death and Taxes in Fantasylandia. The internationally known artist, Enrique Chagoya, mixes historical and contemporary pop culture iconography to make witty and pointed commentary on politics, economics, Wall Street, and the Occupy movement. In these prints, books, drawings, and sculptures, Chagoya nimbly moves from referencing the work of Francisco Goya and Andy Warhol, to including cartoon characters for the purpose of his social satires. In a piece called Escape from Fantasylandia: An Illegal Alien’s Survival Guide, Chagoya uses a folding book form, based on the Mayan Codex. These were written records of the Mayan civilization, most of which were destroyed during the Spanish conquest. In Chagoya’s version, characters such as the mischievous Little Lulu, interact with animated pre-Columbian figures to express his views of how we live in an economic fantasy world. Chagoya, who teaches at Stanford University, will give a Gallery Talk on Thursday, October 11 at 6 p.m. The exhibition continues through November 4. For more information go to their website SonomaCountyMuseum.org. More political art can be found at Sonoma State University, in the Library Art Gallery. Here in the upstairs gallery the current exhibition is called Agents of Change: Art as Activism. The show, which includes prints, posters, and an installation, features the work of Art Hazelwood, Betty Kano, Doug Minkler, Michelle Wilson, the OccuPrint group, and the infamous, Guerrilla Girls. The exhibition continues through November 8. For more information go to their website, library.sonoma.edu. There a number of art Openings and receptions around town this weekend, so be sure to check your local independent newspaper for a complete listing. There’s a lot going on in the visual arts right now, and with the passing of the fall equinox we are now fully in the open studios season. Open studio events are always a wonderful opportunity for both the artists, and the art lovers. This is a chance for you to see where art is created, talk with the artists about their work and process, and see a large variety of artwork, materials and methods. Then if you buy a piece directly from the artist—right from the studio, it has special meaning for you because it’s much more personal. For starters, the ARTrails open studios program was kicked off with an opening reception at Wells Fargo Center for the Arts. ARTrails is produced by the Arts Council of Sonoma County, and includes over 150 artists throughout the area. The actual open studios will take place during the second and third weekends in October. In the meantime you can preview the artwork at a number of locations around the county. Besides the Wells Fargo Center for the Arts, where all 155 artists have something on display; other venues are also hosting preview exhibitions for ARTrails artists. This includes Corrick’s Stationary in downtown Santa Rosa, the Visitors Bureau in Rail Road Square, and Graton Gallery in downtown Graton. For maps and information about all the venues, receptions, and events, check the website, artrails.org. Also in Graton, another open studios event is taking place this weekend at the historic Atelier One. To celebrate 25 years as a studio collective, the artists, designers, and business people who have studios, offices and galleries in this distinctive building invite you to celebrate with them at an opening reception and party on Friday, September 28, from 6 to 9 p.m. Following that, their doors will be open for visitors on Saturday and Sunday, September 29 and 30, from 11 a.m. to 6 p.m. The twenty studios are all located in a historic building that had been an apple drying factory for decades, and is located at 2860 Bowen Street, in Graton. Then for even more open studios go over to Napa where you’ll find 74 artists and craftspeople participating in the annual Napa Valley Open Studios. This Saturday and Sunday, September 29 and 30 will be their second and final weekend. The studios will be open from 10 a.m. to 5 p.m. both days. For information, maps and a list of artists, demonstrations and special events, visit their website, napavalleyopenstudios.org. For a very interesting exhibition and experience in a very unusual location you have to go to Healdsburg this weekend. The exhibition and opening events take place at the Slaughterhouse Space, which is located at the Duchamp Winery. The large concrete and timber building was a slaughter house in its former life, but has been repurposed for more creative endeavors—like showing art. The building is quite astonishing with 30-foot high ceilings, giant hoists, and changing light and shadows that play on the dark grey walls. It retains an eerie but also strangely beautiful ambiance that has inspired many creative people including artists, musicians, performers and film makers. The exhibition, called In My Backyard –The Slaughterhouse As Subject, is an unusual photography exhibit. With the idea of blending art, technology and social media, the curators, Pat Lenz and Dominic Egan, invited over twenty photographers to participate in this project. These photographers come with a wide range of backgrounds and technical equipment, from professional cameras, to iPhones, to pin-hole cameras. They were also encouraged to bring models and props for their photo shoots, which took place over the past few months. The resulting work will be on display throughout the building. But that’s not all; you can also participate in the exhibition. Members of the community, including all ages and skill levels are invited to take part in the ongoing project. By using a digital device, you can upload photos to a special program for the duration of the show and be part of the larger story about creativity and the photographic process. The opening reception is on Saturday, September 15, 5 to 7 p.m. During the reception, Jordan Essoe, whose is a Bay Area performance artist, will be presenting a live performance you don’t want to miss. After that, the exhibition continues through October 27. For more information about the exhibition and especially about how to participate, or directions and hours, check their website slaughterhousespace.com. Then, to get centered again after all that excitement, go over to the Santa Rosa Junior College, where currently on display is a show of Japanese Ceramics. This exhibition of work by 28 contemporary Japanese artists comes from the private collection of William Bayer. The exhibition was organized and curated by Hiroshi Fuchigami, who has been a ceramics instructor at the Junior College for the past 10 years. Hiroshi carefully selected the work of these artists to represent the philosophy and aesthetics of Japanese ceramics art. A reception for the exhibition will be on Thursday, September 20, from 4 to 6 p.m., at the Art Gallery in the Doyle Library, on the Santa Rosa Campus. The exhibition will be on view through October 11. Currently on view at Risk Press, in Sebastopol, is an exhibition of Hand-Crafted Books by the Sonoma County Book Arts Guild. The show features work by 19 artists from the guild. The group has been meeting together to share knowledge and make books for the past six years. On display you’ll find handmade books using a range of styles and methods. From traditional hand-stitched bindings with letterpress text to untraditional processes such as deconstructed books with shredded pages that tumble out of the covers. Some of the artists showing their work are Virginia Harris, Barbara Goodman, Carolyn Batchelor, Dena Bliss, Allegra Burke. A reception for the artists is on Friday, September 7, 4 to 8 p.m. The exhibition continues through September 23. For information and gallery hours, go to their website, riskpress.com. Then, opening next week at the Sonoma State University Art Gallery, is Sound, Image, Object: The Intersection of Art and Music. This exhibition features work by 20 artists from around the country whose art makes reference—either literally or conceptually—to music or sound. Music and the visual arts have a long history of mutual influence and cross-referencing. Composers, especially from the Romantic period, endeavored to evoke visual images through their symphonies. And in the visual arts of the Western world, the depiction of music, singing and dancing goes way back. I think of angels playing stringed instruments in early Renaissance paintings, and even before that in Egyptian art and Greek Vase painting. But these were static images of figures with instruments. It wasn’t until the mid-nineteenth century that an artist, Eugene Delacroix, painted a portrait of Paganini that was an attempt to express the sound or at least the passion of the music. Then later, in the early twentieth century Kandinsky strove to express the spirit of music through color and abstract forms. Eventually, with the ability to record and reproduce sounds, artists began to include actual music in their work. Or in the case of John Cage, whose 1952 composition, Four minutes, thirty-three seconds, only involved the ambient sounds of the concert hall. For contemporary artists today, the possibilities are quite endless, especially through new media and the Internet. The exhibition at SSU includes sculptures, photographs, prints and installations. Some of the artists whose work will be on view are Mauricio Ancalmo, John Cage, Chuck Close, Bruce Conner, Lewis deSoto, Victoria Haven, Robert Hudson, Tom Marioni, Isabelle Sorrell, and William T. Wiley. It also should be noted that this well-chosen subject of music and art connects fittingly to the opening the new Green Music Center on campus. The exhibition opens with a reception on Thursday, September 13, 4 to 6 p.m. The exhibition continues through October 14. For information and gallery hours, check their website, sonoma.edu/artgallery. Right now there are a number of interesting shows in Marin County. For starters I want to mention the Marin Museum of Contemporary Art, in Novato, where currently on view is their Fall National Juried Exhibition. This annual exhibition brings together the work of artists from across the nation. The juror, Renny Pritikin, who is director of the Nelson Gallery at UC Davis, selected 40 pieces representing a wide range of styles, themes, and media. One of the most compelling is a piece by Konstantin Zlatev, called Double Barrel Flute. The artist transformed a shot gun into a harmonious flute that plays peaceful music through instruments once used for destruction. The exhibition continues through September 30. Marin MOCA is located at 500 Palm Drive, Novato, at the Hamilton Air Field. For more information check their website, Marin MOCA.org. Next, at Art Works Downtown, in San Rafael is Organic Intentions. This exhibition highlights sculptural work by three Bay Area artists, Mari Andrews, Mary Button Durell, and Patricia Lyons Stroud. The work explores the relationship of forms and materials as inspired by nature. Andrews begins with natural objects such as stones, twigs, pods and lichen. She then weaves in steel wire that acts to articulate, connect, or transform the object. Durrell, on the other hand, uses only tracing paper and wheat paste to make skin and cell-like structures. She adds a bit of pigment here and there, but mostly leaves the natural transparency of the material to interact with light and shadow. Patricia Stroud’s sculptures are made of wood, cement and beeswax, and reference elements of plant and animal forms, such as invertebrates, sea corals, fungi, and giant nematodes that climb up the gallery wall. The exhibition continues through September 28, with a second reception on Friday September 14, 5 to 8 pm. For more information check their website, artworksdowntown.org. Finally, at Gallery Route One, in Point Reyes Station is The Box Show. This show features 150 Boxes by 150 artists. Each artist, or team of artists, was given a wooden box measuring 10 by 10 by 5 inches. The artist could then do whatever they wanted, including taking the box apart, as long as some part of it was in the final piece. In the hands of creativity, this, as you can imagine, took various avenues. Many of the pieces were made into narrative assemblages both in and outside the box. Others were completely deconstructed to create very unbox-like shapes. One of my favorites is Before there was Television, which is a clever kinetic piece that you have to watch in action to appreciate. This is G R O’s annual fundraising auction that benefits their community outreach and art programs. Their website, galleryrouteone.org has a lot of good and useful information on it, including images of the work and instructions on how to make bids. The Show continues through September 30. There are a number of art openings and receptions this weekend. I’ll mention just a few. First, at the Sonoma County Museum, in Santa Rosa, is Artistry in Wood. This twenty-fourth annual exhibition was organized by the Sonoma County Woodworkers Association, in collaboration with the museum. The juried exhibition showcases fine craftsmanship by local and regional woodworkers. With a growing reputation for showing high quality work, the exhibition now draws participants from all over California, including the talented woodworkers in Sonoma County. This has become one of the largest and most respected annual exhibitions of fine woodworking in the state. The judges for this year’s exhibition were Roger Heitzman, Elliot Landes, and Laura Mays. The exhibition opens with a reception on Friday, August 24, 5 to 7 p.m., and runs through September 23. For more information about events and exhibitions at the Museum, check their website, Sonoma County Museum.org. Then at the Sebastopol Gallery, on Main Street in Sebastopol is Sandy Eastoak: Wild Prayer – Listening to Nature. Sandy states that her paintings are prayers for ecological abundance and health. She uses color and texture to explore her reflections on the loss of forests and the extinction of species. As a writer, Sandy often includes text as part of her imagery. The watercolor and acrylic paintings are accompanied by books of her poetry and other writings. A reception for the artist is on Saturday, August 25, 5 to 7 pm. The show runs through September 30. Sandy will be giving a talk about her work in the gallery on Friday, September 7, at 6:30 pm. The gallery is located on North Main Street, in Sebastopol. For more information, check their website, Sebastopol gallery.com. Finally at the Graton Gallery, in downtown Graton, is their current exhibition called A Murder of Crows: 3 Artists, 3 Objects, featuring mixed-media work by Sally Baker, Marsha Connell, and Micah Schwaberow. The three artists teamed up to select 3 objects. Then each artist created 3 works of art referencing those objects. Also showing at the gallery are paintings by three guest artists, Lorraine Cook, James Freed, and Carol Rosemond. A Reception for the artists will take place on Sunday, August 26, from 2 p.m. to 4 p.m. The work will be on view through September 30. For more information about the gallery and this exhibition check their website, Graton gallery.com. The human figure, as an inspiration for creating art never seems to lose its appeal, even as it has gone in and out of favor through recent decades. A couple of local exhibitions this summer are taking a focused look at the multitude of ways the human figure can be presented through art. For starters a new exhibition opens this Friday at Occidental Center for the Arts, called Body of Art, This figurative show, juried by Diane Senia, features artwork inspired by the human form and is expressed in a variety of media. The exhibition opens with a reception on Friday, August 10, 4:30 to 6:30 p.m.. The timing of the opening happens to coincide with the Occidental Farmers’ Market, which, with the food, produce and interesting characters, makes for a colorful art event itself. The gallery is located at the Old Harmony Elementary School, just off of Bohemian Hwy. The exhibition continues through October 14. For more information check their website, occidentalcenterforthearts.org. Then for more figurative artwork head on up to Healdsburg Center for the Arts, where their current exhibition, called Go Figure is on view. The juried exhibition features over 30 pieces that draw on the theme of the human figure, and includes sculpture, photography, painting, drawing, and mixed media. The Best in Show award was given to Martha Wade, for her painting titled, Dusk. The Artist’s reception is on Saturday, August 11, 5 to 8 p.m. The gallery is located just off the square on Plaza St., in Healdsburg, The exhibition continues through August 27. For more information check their website healdsburgcenterforthearts.com. Then on a slightly different tack, at the Phantom IV Gallery in Windsor, is HARMONY a show of work by three guest artists. This is an opportunity to see some new welded steel sculpture by David Hamilton, as well as abstract oil paintings by Chiyomi Longo, and figurative oil paintings by Martha Wade. The Artists Reception is on Saturday, August 11, from 5 to 8 pm. The Exhibition will be on view through August 30. The Phantom IV Gallery is located at 9077 Windsor Road, in Windsor. For more information call (707) 527-5447. And finally I want to mention Gallery 300, in Santa Rosa, where a new exhibition, called Shadow of the Ego is opening this weekend. The exhibition features mixed media work by Cat Kaufman. In her work, Kaufman uses every-day and found objects in abstract formats to comment on the ironic aspects of the human condition. The opening Reception is on Saturday August 11, 6 to 8 pm, and the show will be on view through September 1. Gallery 300 is located on South A Street, in Santa Rosa, For more information check their website, gallery-300.com. Khysie forwarded your recommendation of my husbands exhibition at QSMC on your “Best Bets” posting. Thank you so much for your insightful comments which should encourage visits to the gallery and interest in his work. It was a pleasure to meet you and have a chance to speak with you at the reception. I very much hope we’ll have more such occasions in the future.